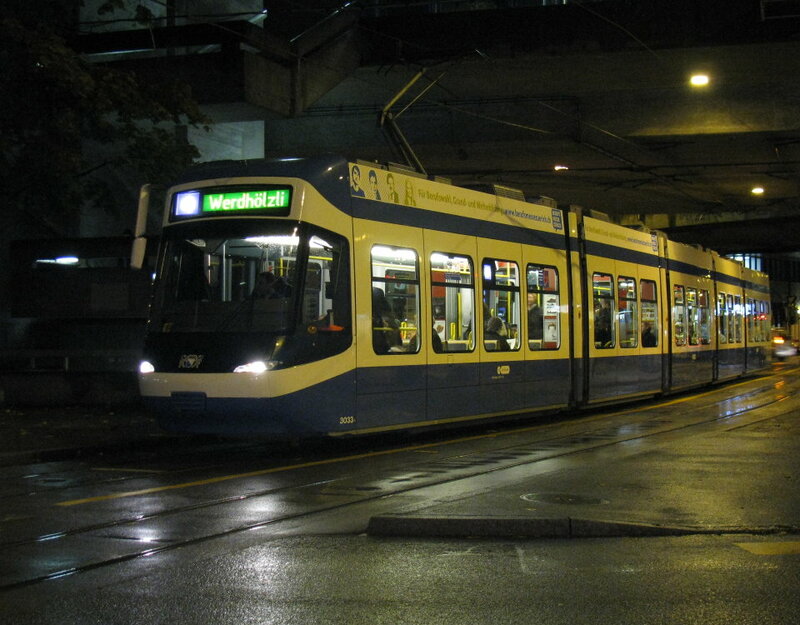 This page presents news and other items of interest concerning the Zürich tram system and connected topics. This is not the official information page of any organisation. All opinions expressed here are my own or belong to those to whom they are attributed. Whereas care is taken to ensure the correctness of news, no claim is made to total accuracy. Visitors are informed that many links from this page are to external sites. Such links are provided for informational purposes only. The author of this site explicitly declines responsibility for the content of external web pages. latest news | older newslogs | articles. 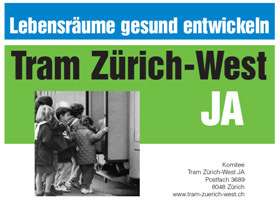 return to Zürich tram home page. As the Sänfte (Tram 2000 low-floor rebuilds) units displaced from route 10 are only partly being redeployed on the new relief working, this change is leading to an overall reduction in the number of such trams required in traffic. Rumoured plans to use Sänfte + 24xx sets as replacement for Mirage double sets have (according to these rumours) not yet been realised as the sets would be too long for certain stops. A solution is being sought. The opening of Glattalbahn's phase two (to the airport) took place on Saturday (13th December). A special shuttle service was operated between the airport and Auzelg, with full operation of route 10 not commencing until the following day. Snow provided a fitting setting for the white trams, while not discouraging visitors – with most trams being well filled and events along the route being well patronised. In service were all Glattal-liveried units (3062-5) and VBZ liveried 3060. This was possibly 3065's first day in public service. I have uploaded a series of photographs of the event here. Unfortunately, in contrast to the press presentation of October, the trams were not specially decorated for the event. For those interested in tram maps, both current and historic, I have come across a most interesting site: www.tundria.com/trams. 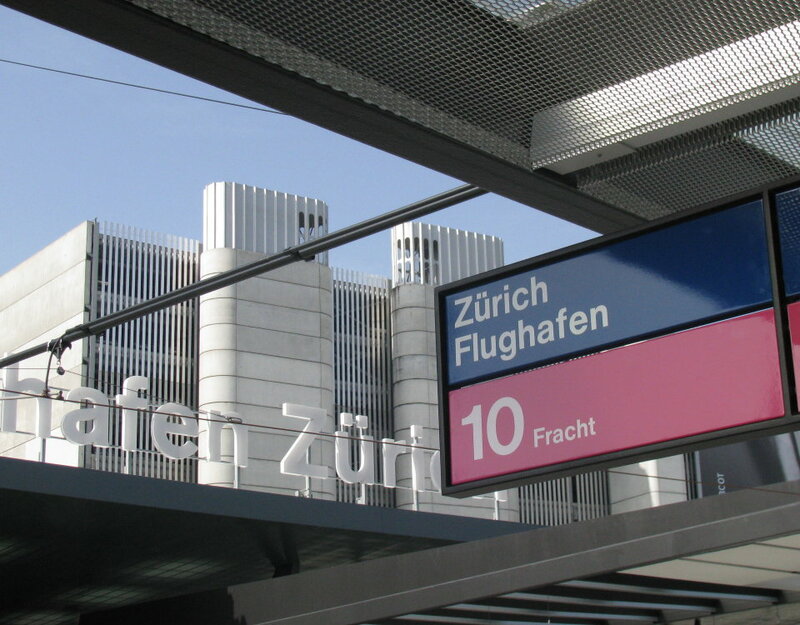 The Zürich page is here (with links to other Swiss systems). The timetable for Cargo Tram and E-Tram are available from the ERZ website. 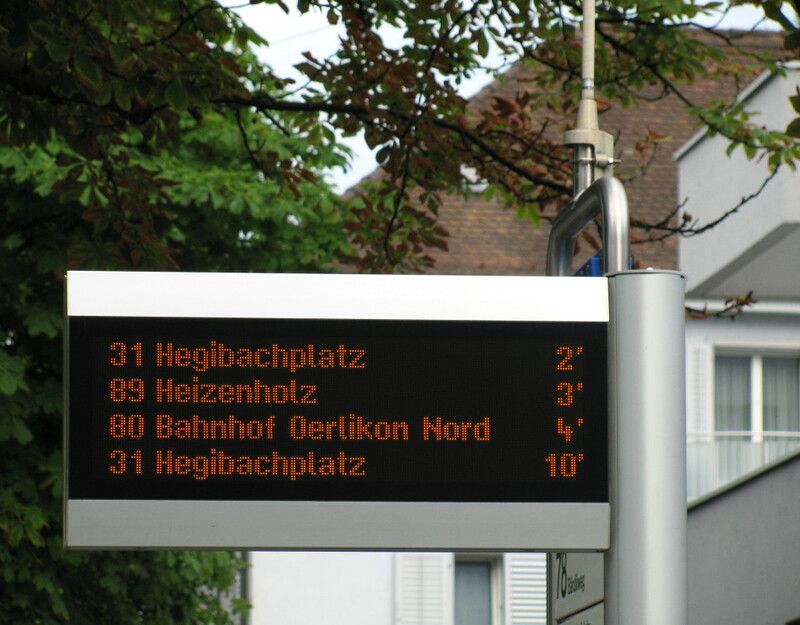 The nine previous destinations will continue to be served in 2009 (although the Tiefenbrunnen service will only run from July onwards due to ongoing works). However, Strassenverkehrsamt is added as a tenth destination as a replacement for Laubegg (which was discontinued in March 2007). As there is no siding here, this new service will, despite what the name suggests, not be tram-worked. 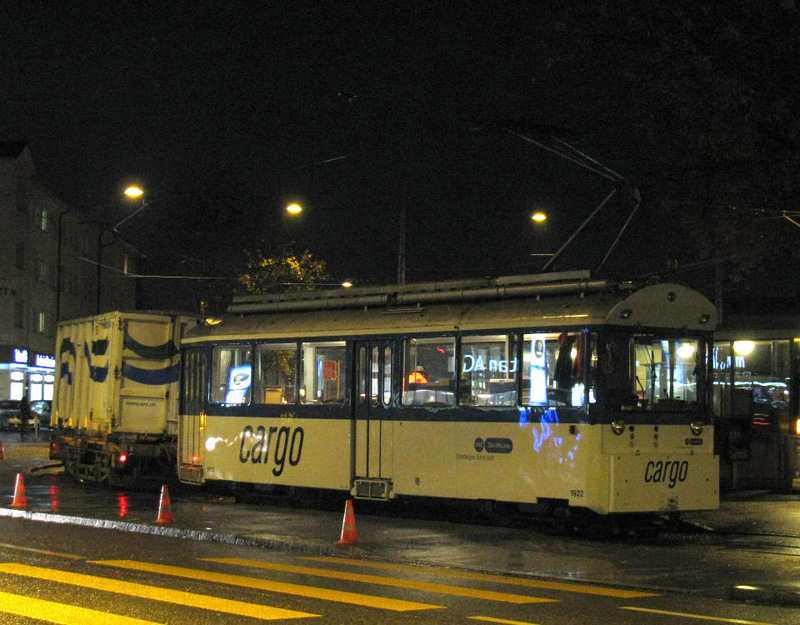 For more background on Cargo Tram and E-tram, visit this website's cargotram page. 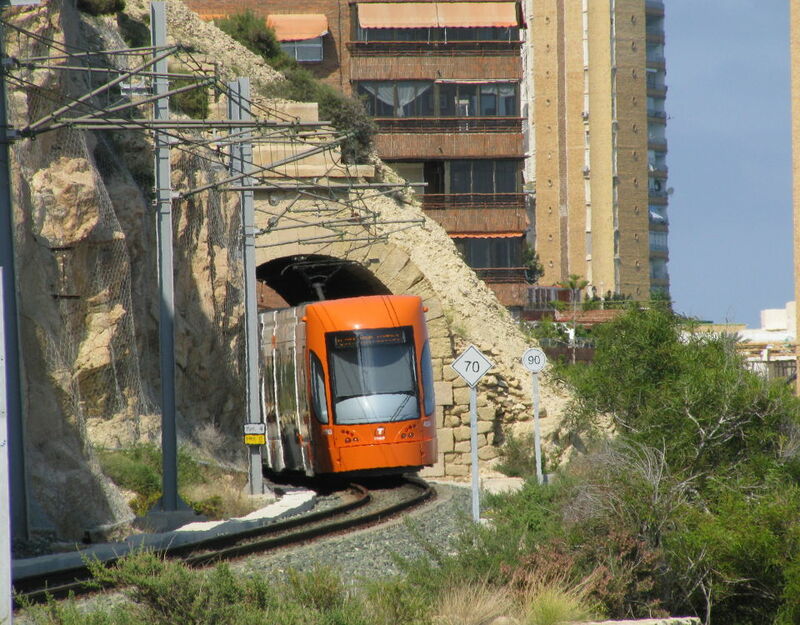 Since the writing of my article, electric operation was extended from Creueta to Benidorm on 2nd June, and the cross-city tunnel between Mercado and Luceros opens today (12th December 2008). A map helping trace these changes can be found here as pdf or here as (low resolution) gif. 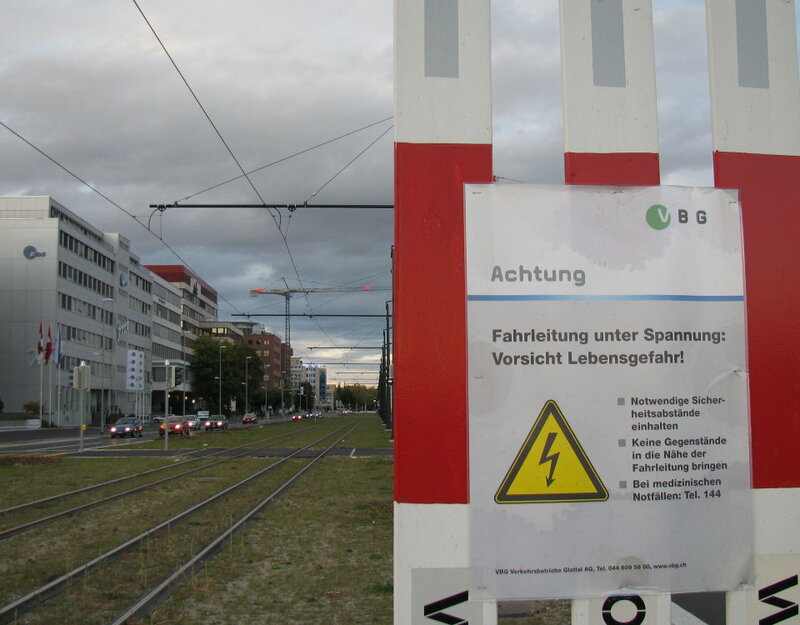 The commencement of regular operation on the second phase of Stadtbahn Glattal is now only three days away. A visit to the line earlier this week did not reveal any test running, but workmen were busy cleaning the stops and adding finishing touches. Full operation of the extension from Glattpark to the Airport will commence in the early morning of Sunday, 14th December. The new line will be operated as an extension of route 10, the operating responsibility of which is being transferred to VBG. 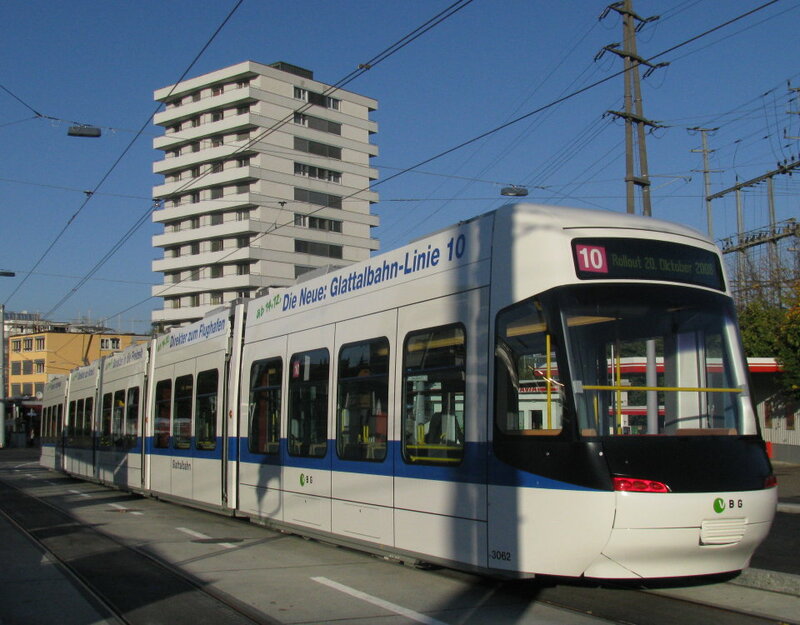 For this purpose, the trams of route 10 heading for the airport will leave their present itinerary at Sternen Oerlikon, and share tracks with route 14 as far as Bahnhof Oerlikon Ost. Here they will turn right onto the new connecting line to Leutschenbach, from where they will share tracks with route 11 to the commencement of the new line at Glattpark. At peak times all services will run through to the airport, offering a 7.5 minute headway. Off peak, every second tram from Hauptbahnhof will continue to turn at Bahnhof Oerlikon, leaving a 15 minute headway for the airport line. It is interesting that the VBG Cobras now on route 10 display "Zürich Hauptbahnhof" instead of "Hauptbahnhof". Maybe they will soon cross municipal boundaries, but they are still far from reaching any other town that would have a "Hauptbahnhof". Initially, a mix of VBG and VBZ-liveried trams will work the service. Of the VBG-liveried trams, only 3062-4 have so far been sighted in service. 3065 is also in Zürich and may enter service in time for the opening. On the day before proper commencement of service (Saturday 13th December), public demonstartion runs will be provided between the airport and Auzelg between 12:00 and 20:00. Information stands and/or special attractions will be provided at the stops of Lindbergh-Platz, Bahnhof Glattbrugg, Bahnhof Balsberg and Flughafen. More information on this can be found on the VBG website. 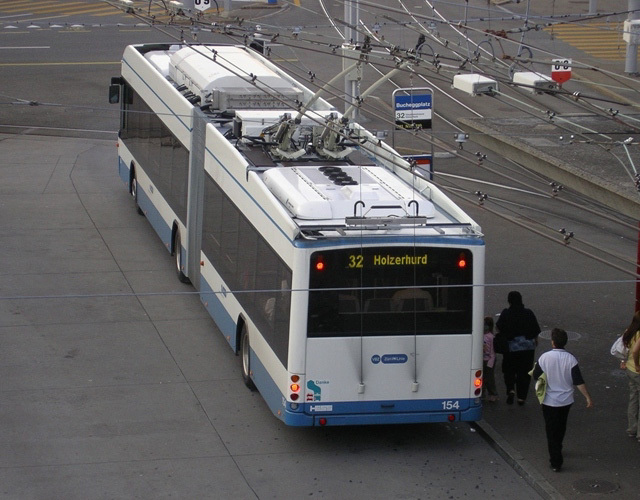 This newslog has previously reported how Winterthur's Solaris Trollino trolleybus 173 visited Zürich for the Trolleymotion conference. 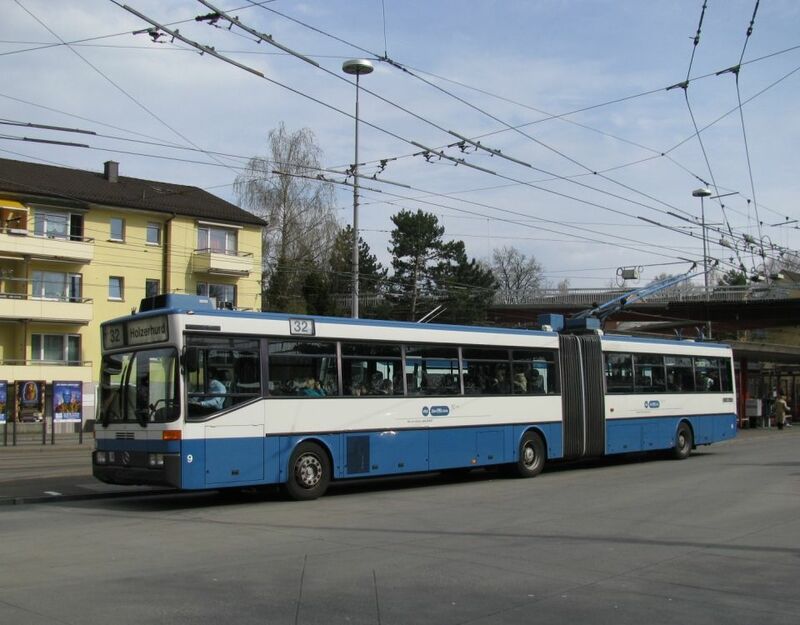 Now Zürich's Swisstrolley3 151 has paid a return visit for demonstration and evaluation purposes in connection with Winterthur's trolleybus tendering process. 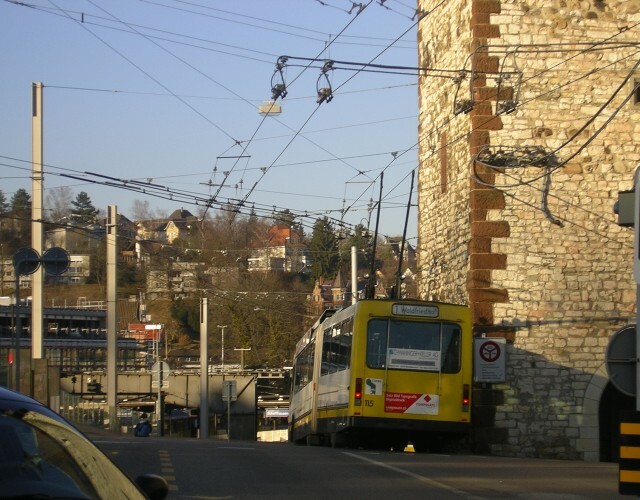 While on the subject of the trolleymotion conference, the picture above is a probably unique view of the Winterthur bus on its way home on Zürich's Hardbrücke, between two Zürich GTZs. The route 46 in the foreground has, like the Solaris, probably just left Hardau depot. This and other photographs of aspects of the event I wasn't able to photograph have kindly been provided to me by Emídio Gardé. A selection of these pictures can be seen here. In the further Zürich news, the only GTZ of the 2-36 batch to remain in revenue service is number 19. 25 has been withdrawn and 11 is scrapped. 143 is the first GTZ to be equipped with matrix displays. These are salvaged from a withdrawn diesel O405 sister vehicle. Meanwhile, appearances of double-articulated trolleybuses on route 32 are becoming increasingly commonplace. In March, this newslog reported that Mirage 1675 had been fitted with matrix displays and was deployed on Einsatzwagen duties (basically a standby tram to fill in service gaps at short notice). It has recently been displaced from this duty by Sänfte 2121, the reason suggested on bahnhofplatz.net being that 2121 has the newer tracking system making it more suitable for the airport extension which is to be opened shortly. The low-floor area, higher capacity and automatically adjustable route numbers also doubtlessly make it more suitable for this duty. 1675 is back in regular service. However, its matrix displays cannot be remotely set from another car so these remain blank while operating as the second car of a double set. 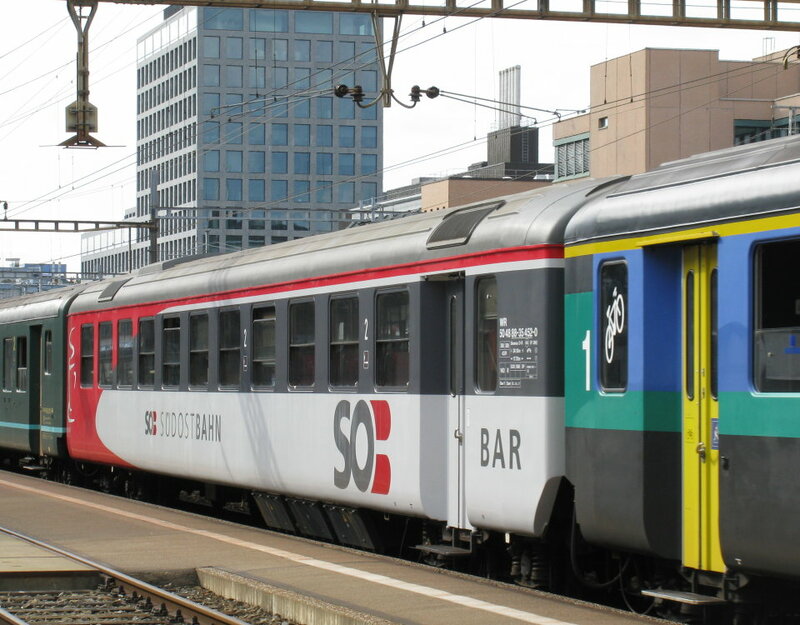 Zürich's S-Bahn Mirage trains (no connection to the trams with the same nickname), or RABDe 12/12 as they were officially called, or RABDe 510 as they later became have been officially withdrawn in a ceremony yesterday, having been displaced by new RABe 514 double-deck trains. The 20 Mirage three-car sets 1101-1120 entered service in 1965-1967 on the Zürich – Meilen – Rapperswil suburban service, where they were a precursor of what was later to become Zürich's S-Bahn. A refurbishment programme was started in 1996, which at the time, it was said, would keep them in service for a further 15 years. 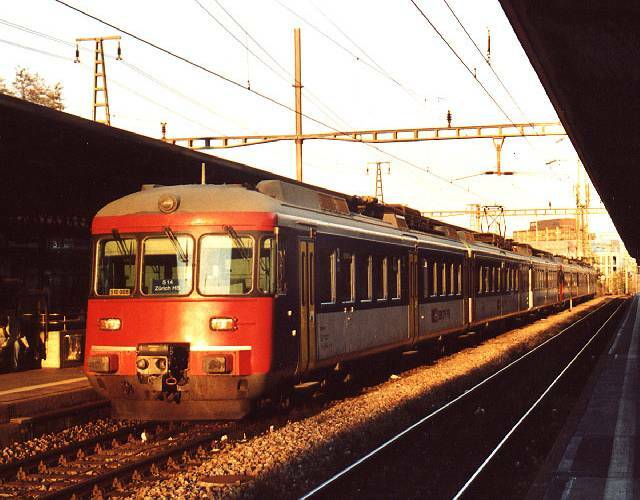 As part of this programme, their distinctive claret colour was replaced by the standard blue and white with yellow doors of SBB regional stock, and their interiors similarly facelifted. At the same time they were re-numbered 510 000 to 510 017. Some trains of this type are likely to be retained as spares until they require repairs, meaning sightings will remain possible for a while. The visitor count on this newslog has just passed 40,000 — that is 10,000 visitors since April. Construction of Basel's cross-border tram extension to Weil will be launched with an official ceremony this Saturday (6th). On 15th January, work will begin in earnest. The 104 million Frank extension will open in late 2012.
International news is probably more focussed on the impact of today's referendum on Swiss drug legislation. 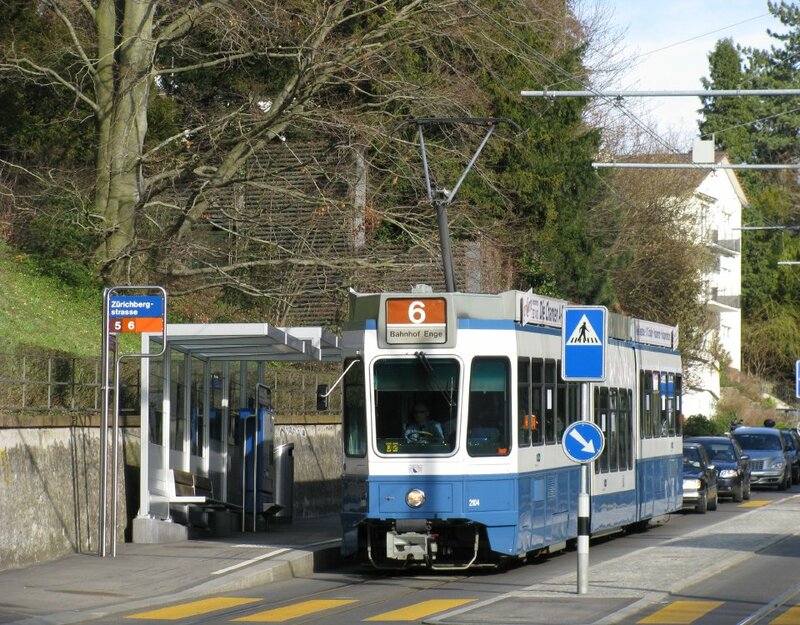 However, in the other news, cantonal voters rejected VCS's initiative to extend the tram to the zoo entrance. Only 27.2% of votes cast were in favour. The defeat is disappointing but was to be expected. There was not a very high profile campaign for this initiative, with VCS probably being more concerned with defending the right of about 30 organisations including itself to raise planning objections and defer construction projects when they believe environmental standards are not fulfilled (Verbandsbeschwerderecht ). Without this right, regulations can more easily be infringed. The law has been broadly criticised by the business sector. However, 66% voted in favour of retaining this valuable right. 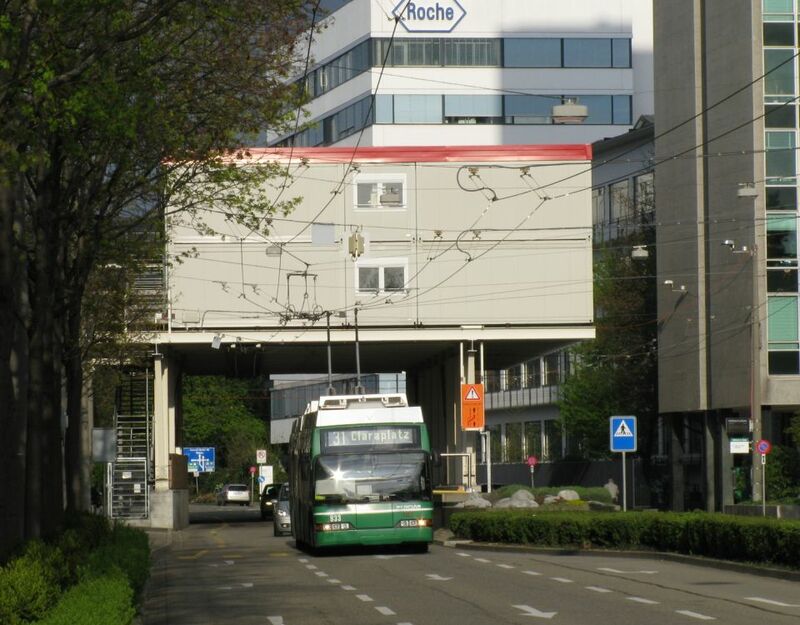 Another tram-related result concerns the redefinition of building lines in Neufrankengasse in Zürich's Kreis 4. This modification will permit the future tram route 1 to use this corridor. Despite local opposition(where it was rejected by 54.7%), city voters approved by 61.8%, meaning the building line can now be changed. 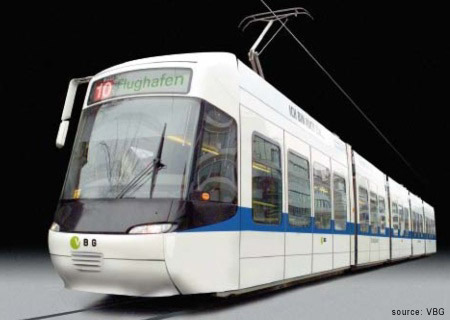 In an interview in the Tagesanzeiger newspaper, city councillor Ruth Genner says the new tram line will be built in 10 to 20 years time (it was not actually included in VBZ's Vision 2025 in 2006). This result fulfils a valuable prerequisite in safeguarding the alignment. Yesterday was the last day of a two-day trolleybus conference, Trolleymotion. 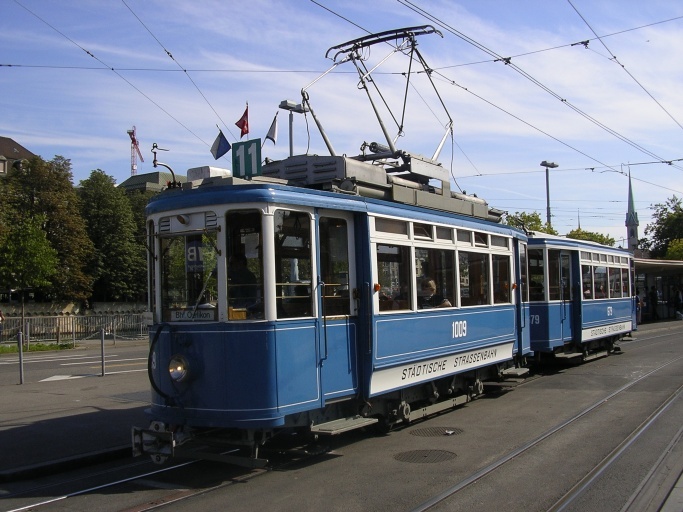 The event ended with demonstration runs with two trolleybuses that had been brought to Zürich especially for the event. These were Solaris Trollino number 173 from Winterthur and a Neoplan Electroliner destined for Barquisimeto (Venezuela). These runs started at Hardau depot, initially running on diesel as it was not clear whether the trolley shoes could handle the pointwork and the tram crossings. 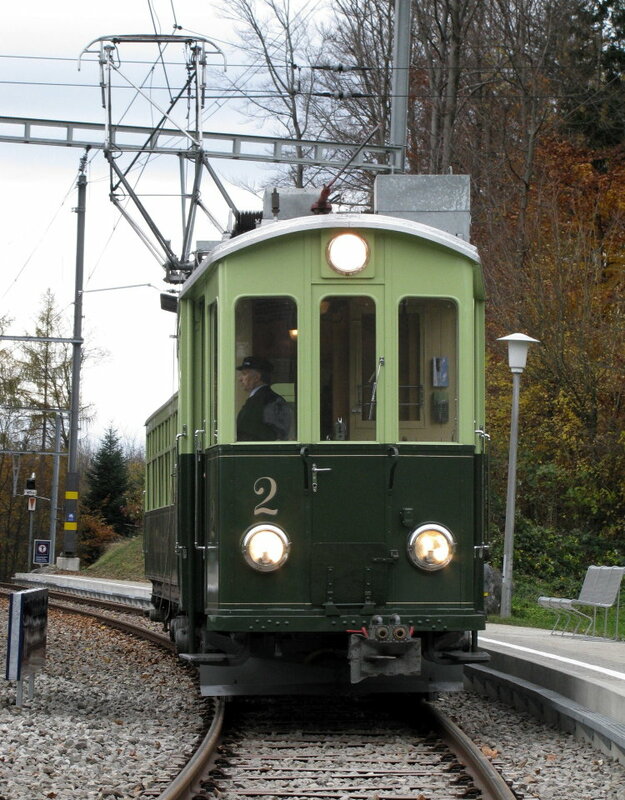 From Farbhof, the Trollino ran to Schlieren under electric power. The Electroliner tried to do the same but had to revert to diesel following a dewirement. On the return run, the Trollino ran electrically all the way. A series of photographic impressions of this truly amazing and rare event can be found here (or as an index, here). Trolleymotion.com reports that seven ex-Basel Neoplan trolleybuses (924/6-7/9-31/3) are now in the Bulgarian city of Ruse. They were sold to Ruse via a dealer in Sibiu (Romania). Ruse's bus operator is now working together with Egged Corporation of Israel, and has a program to modernise the fleet by acquiring 50 second hand trolleybuses. Among the vehicles being replaced are further ex-Basel trolleys, notably 5457-4560 which are ex 357/9/60/3, originally 57/9/60/3 dating to 1956. While on this subject, it is worth noting that of this same batch, number 358 (ex 58) which was an operational (but sadly underutilised) museum vehicle from its withdrawal in Basel in 1995 until finally being stored in 2001, passed into the custody of Retrobus earlier this year. This society has also acquired ex-Schaffhausen 207 (originally Luzern 227) which had been preserved in Britain and saw use at various preservation locations there over the years, but whose previous owners were unable to look after it any longer. This newslog has now been online for five years. In the last year the newslog page alone scored 14274 visits (38935 over the last five years). Thank you to all regular and not so regular visitors who contributed to this and please keep spreading the word to anybody who may be interested. Of course I am also always happy to hear from anybody who has any contributions, comments or suggestions, or just wants to say hi. The third VBG-liveried Cobra, number 3064, is now being tested in Zürich. The following Mirage trams were reported stabled in Wollishofen depot on 5th Nobvember, presumably withdrawn: 1606-7/9/11/6/8/24/44 and Kühe: 1711-2/23-4. Also Cobra prototype 3001. 1644 has since been reported back in service. The only O405 GTZ trolleybuses of the 2-36 batch still in regular service are 19 and 25. This website's latest photo update features impressions of the farewell tour of Uetlibergbahn Ce2/2 2 + C41. 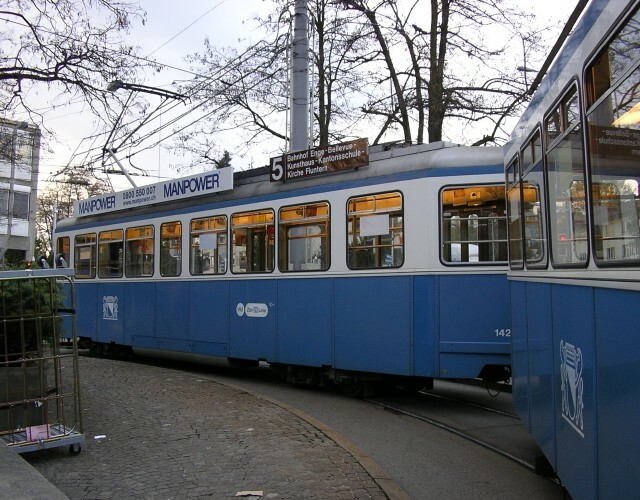 For those wishing to watch or ride this tram one last time, it will be working on 6th and 7th December, departing Hauptbahnhof (platform 2) at 13:16, 14:16 and 15:16 and Uetliberg at 13:47, 14:47 and 15:47. The rides are free but registartion in necessary with SZU (+41 44 205 45 11) prior to 28th November. Ticket machines: ZVV has presented the first of its new ticket machines. These have a touch-screen interface and will gradually replace the push-button machines of the early 1990s. Besides selling tickets, these provide timetable information, and appear to be of similar design to those used by SBB. Zoo tram: VCS's referendum on the tram extension to the Zoo entrance will be held on 30th November. With both the official recommendation and the zoo director, Alex Rübel, being against the project, this looks set to be an uphill struggle. 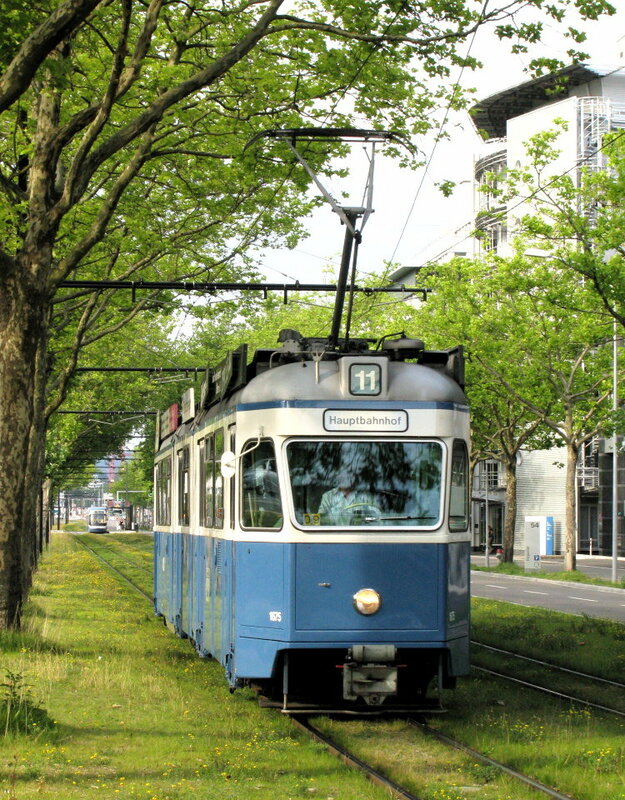 Rübel claims the tram would eliminate 200 parking spaces, forcing zoo visitors to walk further and inflicting additional parking and traffic on the surrounding residential streets. The extension of 570m has been costed at 27.2 million, a very high price indeed, which further damages the case for the tram. In an article in the Tages Anzeiger newspaper of 3rd November, a VBZ expert admits that a cheaper variant would be possible that would also affect fewer parking lots. This would partially use enlaced track. The probable reason for Rübel's hostility, however, is the aerial cable car project he wants to see realised between the zoo and Stettbach. Although the two projects are not necessarily mutually exclusive, they can easily be perceived to be and the realisation of one might set the other back by decades. The cable car would cost 17 millions and be privately financed. This would possibly imply ticket prices of 10 franks which would be acceptable considering the cable car an attraction it its own right, but not necessarily make it universally attractive, especially not for families and groups. Furthermore, there is opposition to this project in the Stettbach area on account of additional traffic and car parking it would attract. 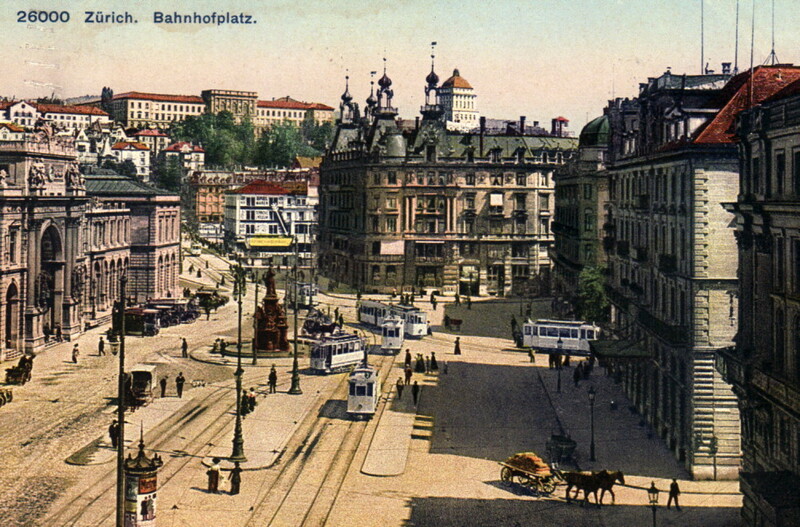 On bahnhofplatz.net, it is also pointed out that it's terminus would require the same area as the tram line at zoo and so probably eliminate the same number of parking lots. Let us wait and see how this drama develops. Tram rolling stock: Reports in bahnhofplatz.net indicate that the Mirage era on route 7 has now ended, with the service being entirely in the hands of Tram 2000 sets. The newest Cobra, the VBG-liveried 3063 has joined 3062 on route 10. Trolleybus fleet: Of the Mercedes/ABB O405 GTZ trolleybuses 2-36, number 19 has been sighted in traffic regularly in recent days. Possibly this is the only member of its batch to still see revenue service. 36 has reportedly joined the driver training fleet. Contrary to earlier reports on this newslog, the status of the driver trainers is as follows: 4122 (ex 1) withdrawn 16.03.07 and scrapped 16.06.07, 4123 (ex 2) scrapped 05.07.07, 4124 (ex 3), 4126 (ex 4), 4128 (ex 33), 4129 (ex 32, renumbered in January 2008), 36. 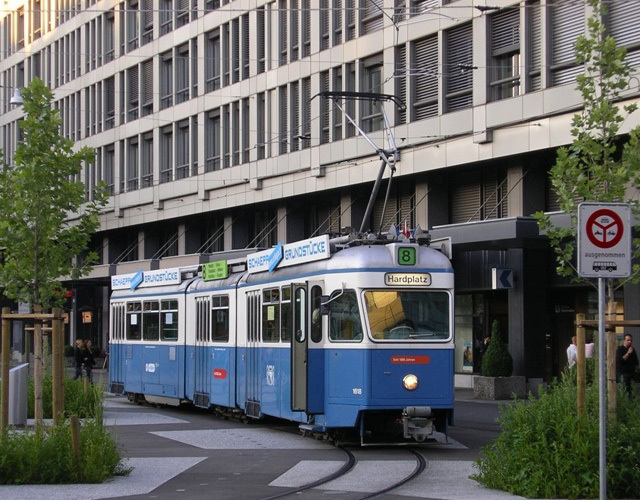 A second VBG Cobra is now running in Zürich. 3063 was observed on a test run yesterday. Lausanne's rubber-tyred metro (M2) commenced regular operation this morning. The line from Ouchy to Epalinges is said to be Switzerland's first "proper" metro. Between Ouchy and Flon it re-uses the alignment of the Ficelle cog railway, which was closed in January 2006. Plans to re-deploy the old Ficelle stock in the French mountain resort of Villard de Lans have meanwhile been dropped. Only a day after its official rollout, VBG's first Cobra saw service on VBZ's route 10 yesterday. Photos of this and more can be found in this website's latest photo series. 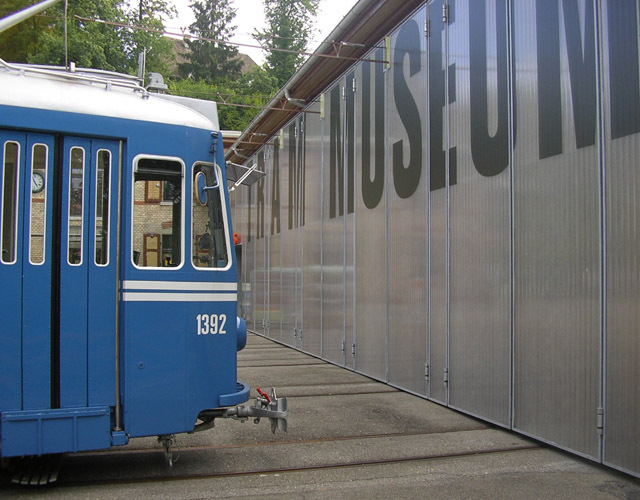 Tram Museum Zürich is organising two photo tours this autumn. A farewell tour for Uetlibergbahn Ce2/2 2 + C41 will be operated on 9th November. It departs SZU platform at Hauptbahnhof (platform 1 or 2) 13:46 and return circa 16:00. Price: 38 Franks. 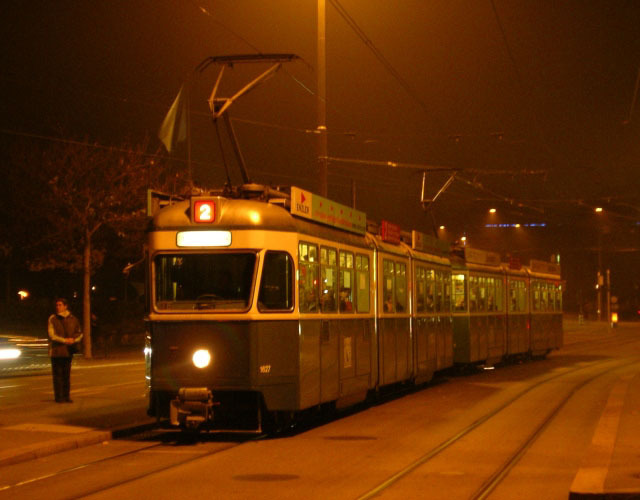 The second tour will be on 30 November using Swiss Standard Tram Be4/4 1530 (Pedaler) and B4 trailer 732. It departs Gessnerallee at 10:00, reaching Burgwies at 13:30 featuring many photo calls. There is no charge for the ride but a collection will be made. No reservation is necessary for either event. Glattalbahn's first Cobra, 3062, was presented to the press this morning. Quite by accident, I managed to capture the decorated tram the same afternoon. According to Tram magazine (issue 95/08.-10.2008), Mirage 1614 was withdrawn following an accident in April. To handle the extra traffic during the EURO 2008 championships, the following units were temporarily reinstated between 6th and 17th June: 1606/12/5/9-20/2/711/23-4. Additionally withdrawn are now 1607/16. For the first time since 1928, the 5-hour break in tram and urban bus services on the morning of 1st May did not occur this year. 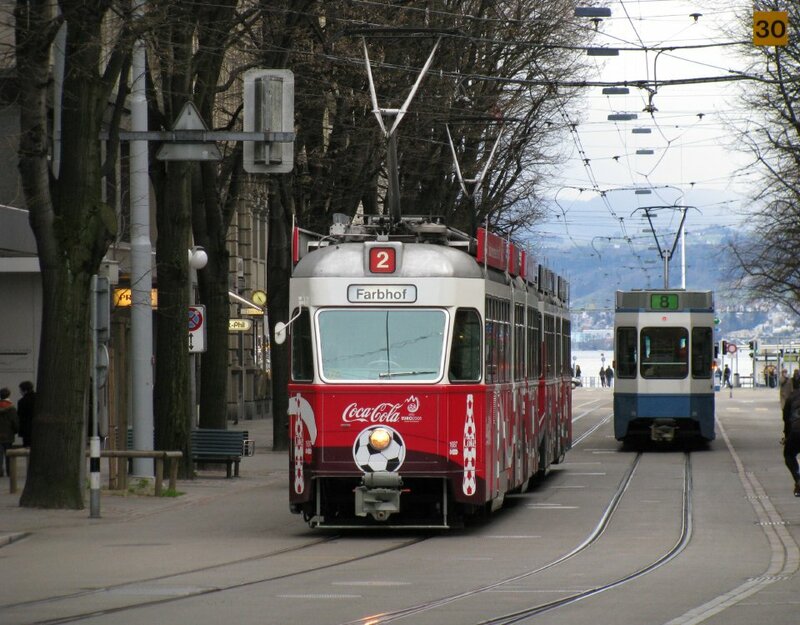 Zürich's trams now run during all normal operating hours every day of the year. Withdrawn trolleybus 31 was the victim of a fire brigade training exercise on 6th June. Following the visit of the Hess hybrid bus demonstrator in March, Solaris' equivalent (which is, however, single articulated) saw service with VBG for three weeks from 13th June. The bus is owned by Welti-Furrer and normally used in Lenzburg. 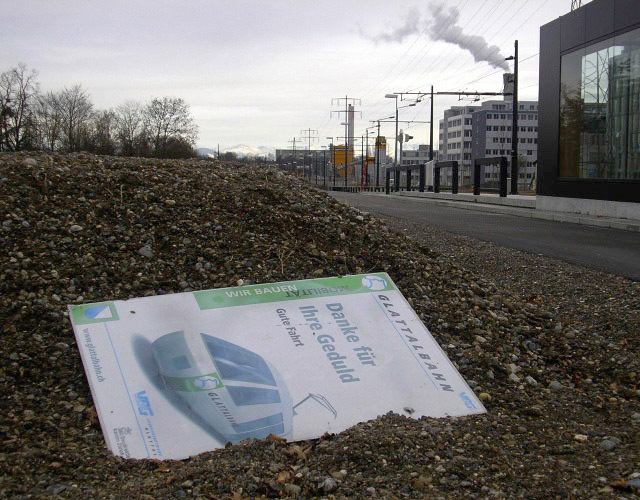 The magazine also discusses plans for a tram in Biel. This would be built as an extension to the ASM Biel – Täuffelen – Ins line and continue from Biel Bahnhof to Bözingenfeld. If all goes to plan, construction could begin in 2014. In Geneva, it has been decided to extend the Cornavin – Onex – Bernex project from the Bernex P+R site to Bernex Vailly. The additional section will be opened with the rest of the line in 2011. 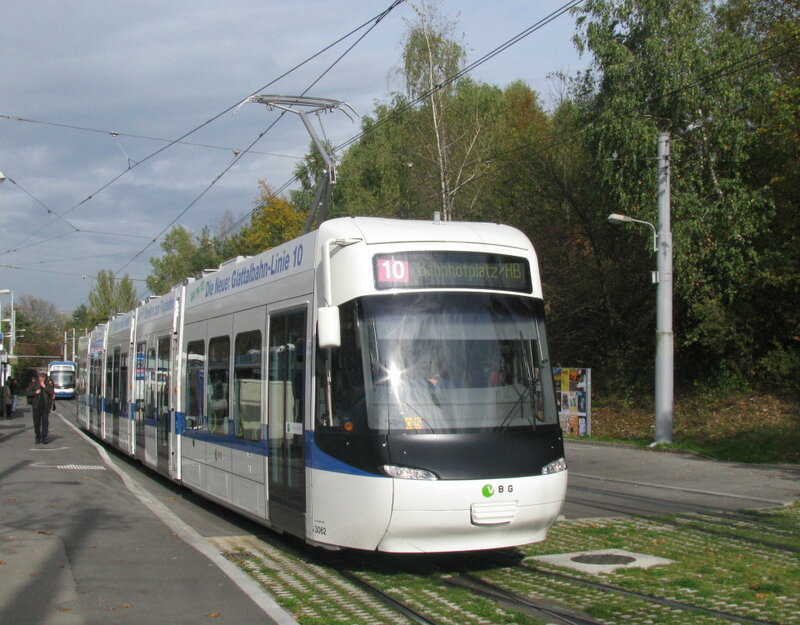 Geneva is equally planning a tram extension to Meyrin (to open in 2010), an extension of which will cross the border into France and reach Saint Genis-Pouilly P+R in circa 2013. The branch to Champs-Fréchets is set to open in 2009. Some changes have been made to the alignment in view of objections. According to bahnhofplatz.net, testing on the second phase of Glattalbahn started as planned on Monday (13th). The following units are reported observed on the first day: Cobra 3052, Tram 2000 Sänfte 2121, Mirage 1660+1657, Tram 2000 2006+2312 and 2057+2401. The VBG Cobra 3062 is also being tested, but has so far not been seen on the new line. It will be used for the official press presentation of the new line on Monday (20th). Glattalbahn's first Cobra is to be presented to the press at Glattpark on Monday 13th October. Test running on the airport line will begin on the same day (a week earlier than previously announced). On 13th December, a day before official timetabled operations start, VBG will hold an "open day", running a 10 minute service from 12:00 to 20:00 between Auzelg and the airport. Further details will be announced closer to the event. The first Glattal-liveried Cobra, 3062, was delivered to the VBZ Altstetten works yesterday. Driver training on the airport line is set to begin on 21st October. 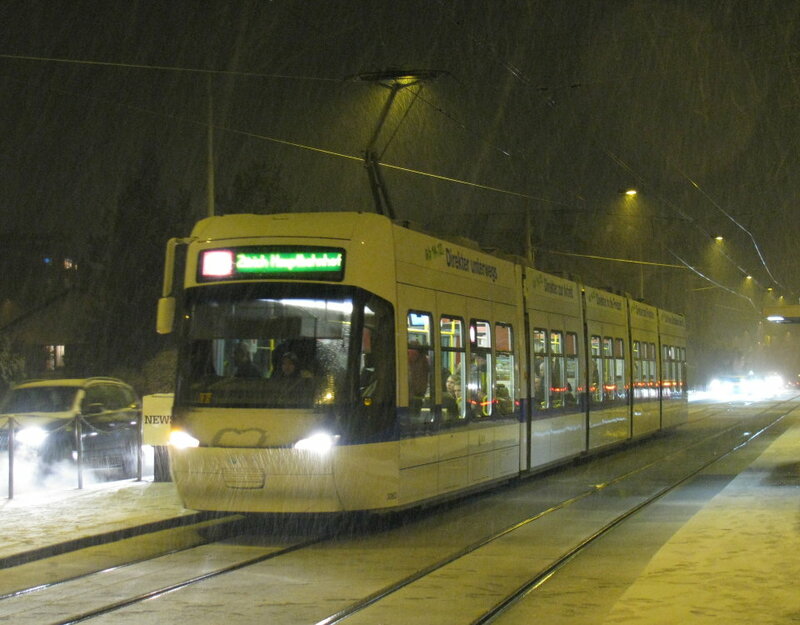 The SZU (Uetlibergbahn) heriatge "tram" set Ce2/2 2 + C 41 saw its last use yesterday. SZU no longer wishes to provide heritage services in future due to intensification of the regular timetable and shortage of stabling facilities.Four new dual-voltage trains will be acquired in 2011/12. 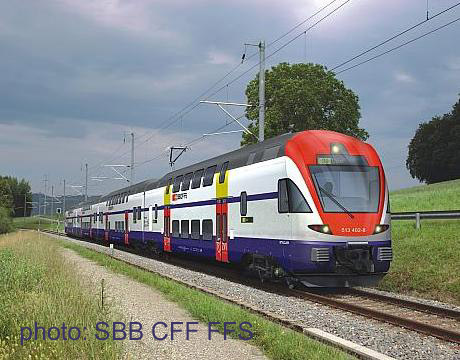 These will permit the sets to be stabled in the AC-electrified part of the depot, but also allow a future conversion of the Uetliberg line to AC. 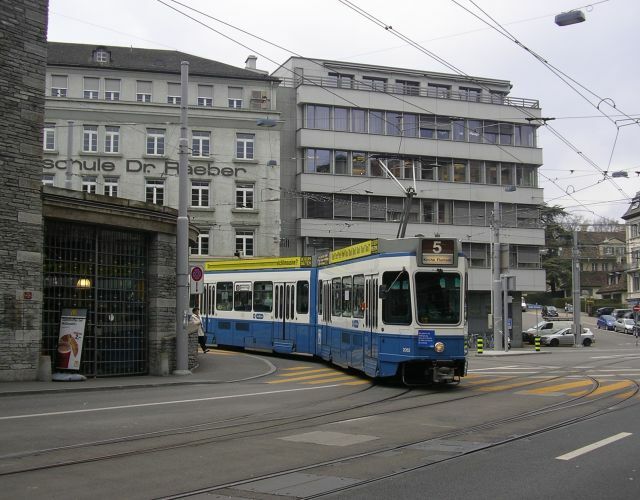 The Ce2/2 dates to 1923 and is of technical interest as it was designed to be regaugeable in view of the never realised plan to integrate the line with Zürich's tram network. SZU is seeking to transfer the cars into safe hands, it is not however clear what these may be. A visit to the second phase of Glattalbahn yesterday revealed overhead to be practically complete along all visible sections of the line. The link between Bhf. Oerlikon Ost and Leustchenbach is also complete as far as track is concerned with overhead being fitted. The process of loading a fresh batch of trams for Vinnitsa was begun in Altstetten works today. The following GTZ trolleybuses have been scrapped: 7 (25th), 8 (today), 9 (date unknown). The latest website update features photos of my recent visit to Seaton and Brussels. It is reported on bahnhofplatz.net that the rollout of 3062, the first Cobra in Glattal livery, will not take place until 20th October. 17.09.2008 - Schaffhausen's trolleybus saved! 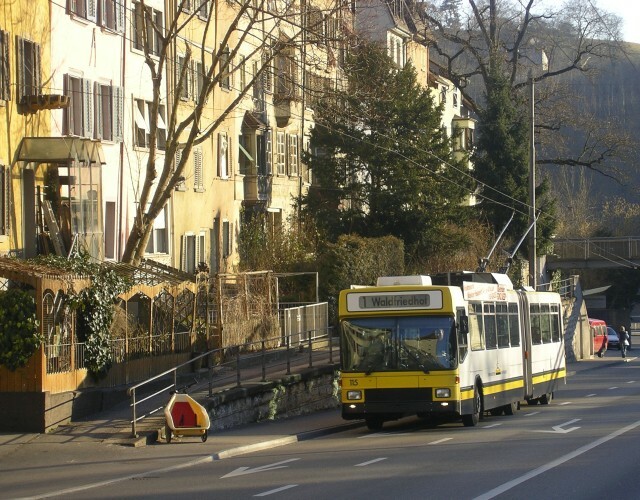 Schaffhausen's city council has decided in favour of its trolleybus. A second study by INFRAS (the first had recommended abandonment) has shown that despite the risen price of oil, full dieselisation would still cut costs. 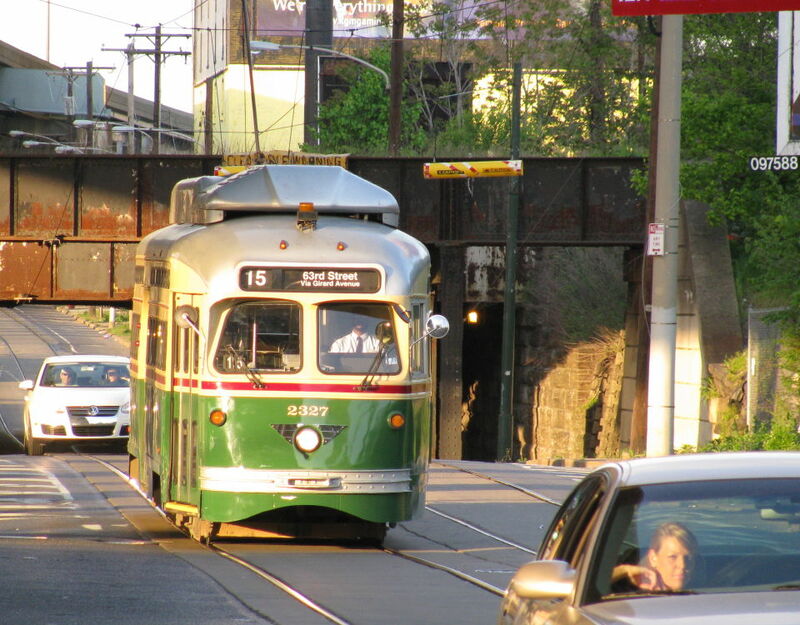 A mixed trolley/diesel/bio-gas fleet would, however, lead to higher costs, as the city is too small to justify the operation of three modes in parallel. 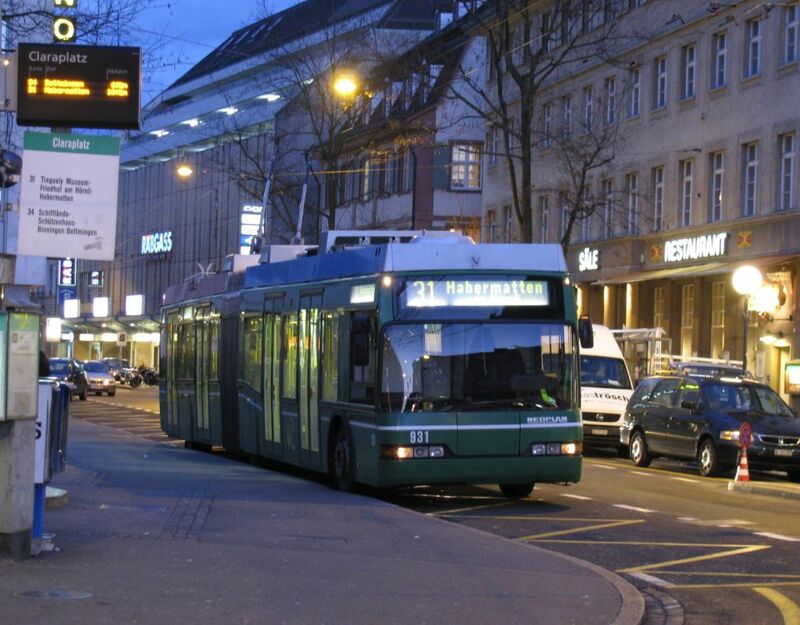 The council has decided against bio-gas buses and is proposing to retain trolleybuses on route 1 (currently Schaffhausen's only trolleybus route) but also introduce them on route 3 (Sommerwies � Krummacker). The higher costs are considered justified in view of the noise and emissions avoided. The investment required to retain the mode on route 1 are 11.1 million Franks, of which 8.4 for seven new trolleybuses (the current fleet has eight), 0.6 for a spare diesel bus, 0.8 to replace the overhead repair vehicle and 1.3 to replace an electricity substation and varia. I'm not sure why the diesel bus should be included in the trolleybus costs as it would be required anyway. The electrification of route 3 (after 2013) would cost a further 21.6 million. The timeline for the investment is as follows: 2008/2009: approval of financing of investment for route 1, mid 2009: tendering for new trolleybuses, 2009: acquisition of overhead vehicle and diesel bus, 2011-2012: delivery of seven trolleybuses, 2013 or beyond: decison on electrification of route 3, to be decided: new substation in Neuhausen. Route 1 is to resume working over its full length this autumn, with the building work in Neuhausen that has led to it being curtailed approaching completion and the overhead lines to be re-instated. It had earlier been suggested that this section not be re-wired, hence accelerating abandonment. This is very good news indeed, as especially in view of opposition from Neuhausen, it seemed that Schaffhausen was set to follow the short-sighted lead of Basel and Lugano. Well done Schaffhausen! See also this website's trolleybus page. I have just returned from a family break in England (including a visit to the Seaton tramway and a call at Brussels on the way). Pictures of this will follow [->here]. In the meantime, I hope I haven't missed any important Zürich news. Reports on bahnhofplatz.net indicate that as of 14th September, the following Mirages were stabled on the sidings behind Altstetten works (and presumably withdrawn): 1614-5/9/20/2/39/83/7/9/717 – all with their Zürich coats of arms removed, which may indicate they are headed for Vinnitsa. Also stabled were B4 trailers (FFA) 787/9/93/5-6/8. Stored in Wollishofen depot were Mirages 1606/7/9/16/8/44/711/2/23-4 together with Cobras 3001-2, snow brooms 1923-4 and Märlitram 1208 (the inactivity of the latter three vehicles is presumably just seasonal). It is also reported that 3002 will be the next Cobra prototype to be dismantled. The latest Cobra delivery is 3061, which would suggest that next to arrive may be the first of the Glattalbahn liveried series, 3062. The first of BLT's Tango prototypes (or at least its rear half) arrived at BLT's Oberwil depot today. 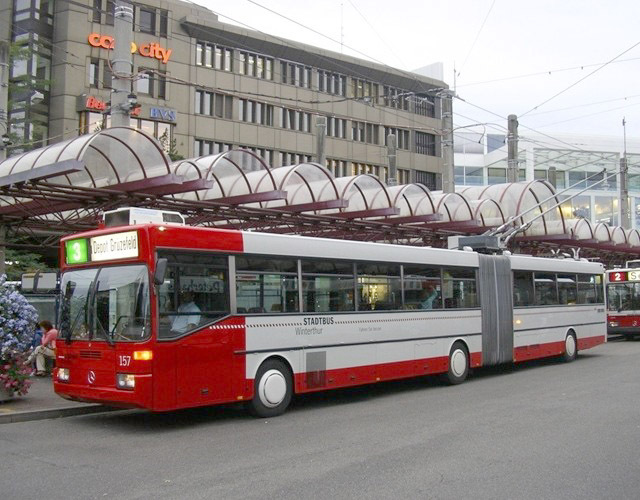 On 15th August, Winterthur invited tenders for 21 articulated trolleybuses. The deadline for tenders is 10th October and the succesful bidder must supply either a first vehicle or otherwise loan an equivalent demonstration vehicle in seven to ten months time for an evalutaion period of two months. Series delivery is expected between July 2009 and December 2010. The new trolleybuses will replace Mercedes/ABB O405 GTZ 141-161 of 1988. 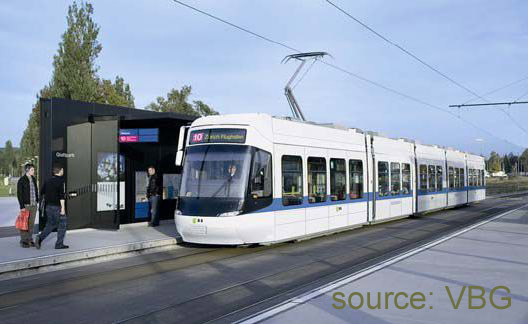 The acquisition follows January's decison to retain trolleybuses operations in Winterthur. 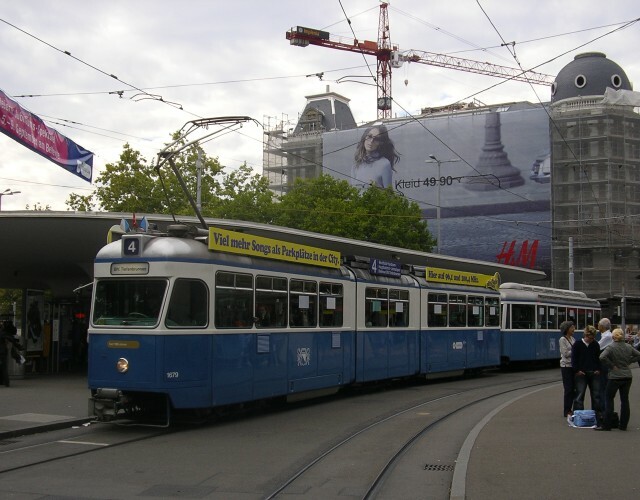 With the Euro 2008 over, all-over advertising trams are once again a rarity in Zürich. The latest is 2005, advertising the musical Ewigi-Liebi. 2005 was until recently the 125th anniversary tram. The latest photos on this website are a series of scenes from Freiburg, Zürich (including Glattalbahn), and Basel. 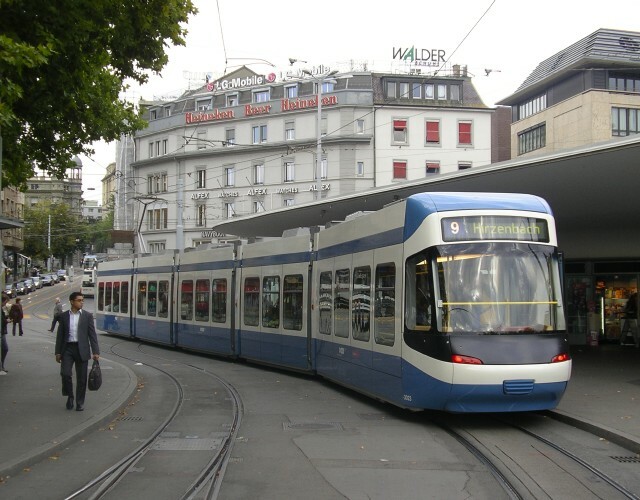 Construction of Tram Zürich West is to be launched at a ceremony at Escher-Wyss-Platz on 9th September at 9:09. This website's latest photo update presents a series of photos, mostly taken this April in Jena and Naumburg. At least one Mirage+B4 set is running in Vinnitsa. The cars are numbered 261 and 262. 261's trailer connections would suggest it is one of 1601-5. Zürich's network map is undergoing a graphic redesign (above right). The lines are thinner and pastel colours facilitate following some bus routes across interchanges. The new map will be introduced with this December's timetable. 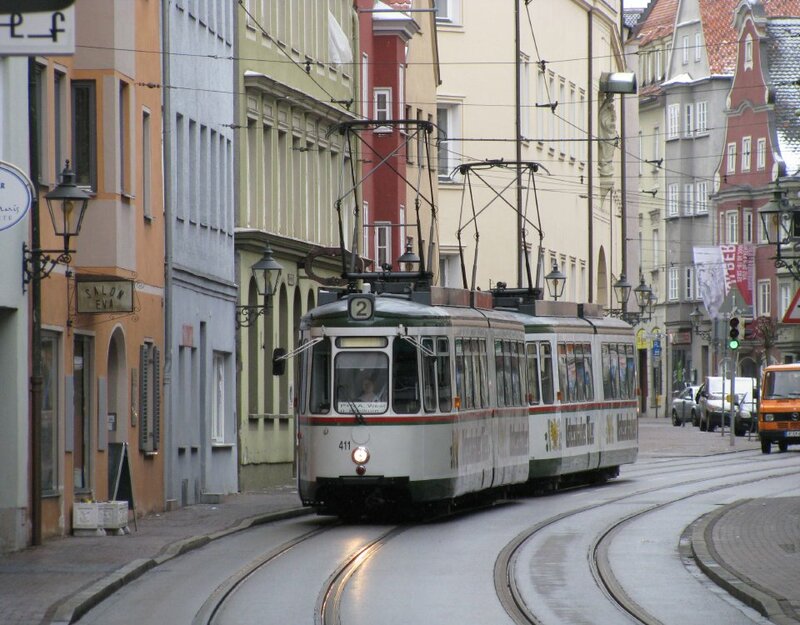 Yesterday's photo series features Winterthur trolleybuses and railway scenes from Altstetten. 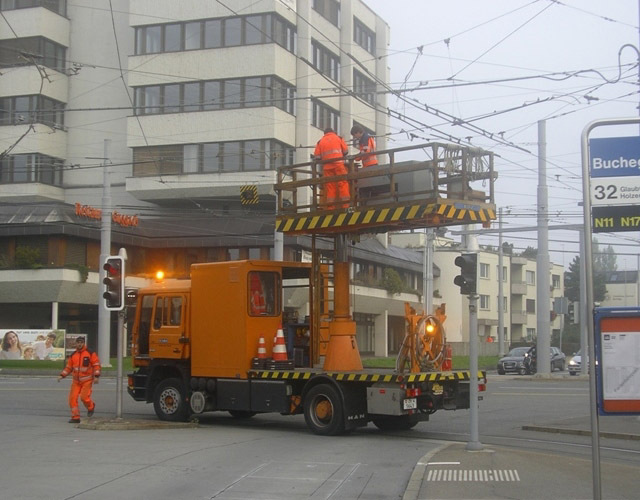 Earlier series feauture Cobras and track replacement work at Bucheggplatz. A bit off-topic maybe, but undoubtedly one of the factors that makes the Swiss transport (and especiall rail) system so attractive to the enthusiast is its vast variety of local specialities. These are not all restricted to mountainous and touristic regions. Indeed several companies with local roots and identity operate within the scope of Zürich's S-Bahn and even into urban Zürich proper. One of these is the SOB (Südostbahn), which operates the Gipfeliexpress. This is a loco-hauled train with a restaurant car running from Einsiedeln to Zürich Altstetten and back twice a day. The operation of such a train on what is basically a shortish commuter service must be a rarity indeed in these modern times. However, all good things must come to an end, and SOB will run the restaurant car for the last time on 12th December. The reason cited is the age of the restaurant car. The train is generally well patronised, and the restaurant car much used by commuters to take breakfats on their way to work in Zürich or a snack on the way home – hence the name Gipfeliexpress (croissant express). For the casual traveller, riding the other way is more recommendable, both in terms of timings (why not spend a day in Einsiedeln?) and to avoid the commuter flow. 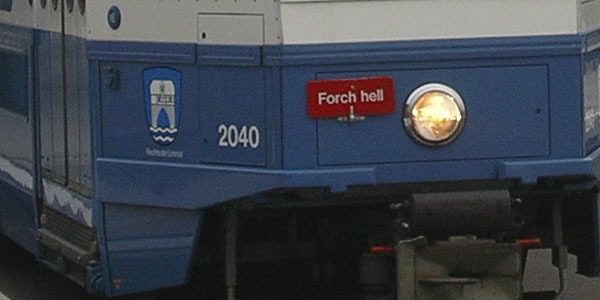 The locomotive is usually one of the ex-SBB Re4/4 iv units. The train does not run via Zürich Hauptbahnhof but uses the (mainly freight) curve from Wiedikon into Altstetten. 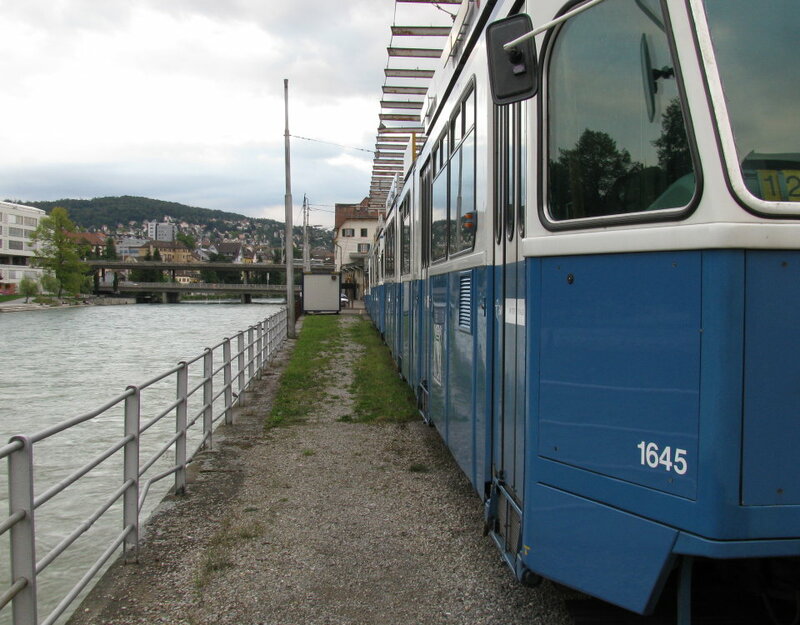 The train is definitely a must-do for the transport enthusiast spending some days in the Zürich area. 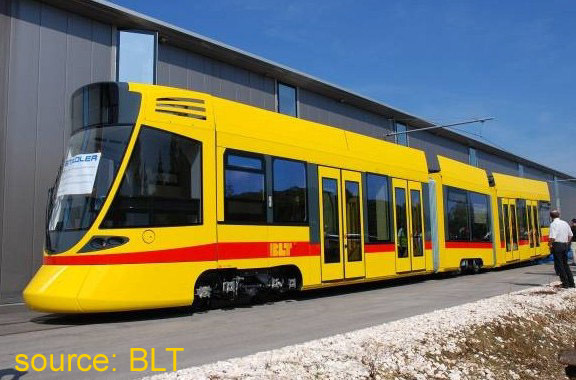 The first of Basel's four prototype tango trams is to be delivered to BLT's Oberwil depot on 5th September and will enter service in December. With deliveries of the new trolleybuses complete, time is running out for the remaining Merdedes/ABB O405 GTZ of the batch 2-36. At the end of June, nine were still in service: 9-11/8-9/23/5/8/36. Additionally there were four driver trainers 4123/6/8-9 (ex 3,4,33,32). 23 was withdrawn immediately after the ending of the event it was advertising (the EURO 2008). It was followed by 18 on 8th July. 9, 19 and 28 are set to vanish in the coming weeks with 10, 11, 28 and 36 likely to last to the end of the year. The reason for their reprieve is overhaul work on their sister vehicles of the 101-143 batch, which are to be retained for at least another four years. 4126 is now also withdrawn, but two driver trainers are likely to be retained beyond the end of the year. 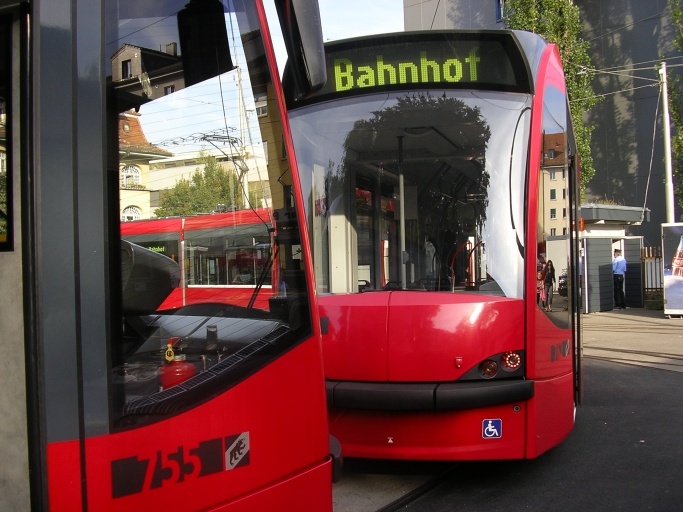 According to reports on bahnhofplatz.net, the only Mirage without a driving cab (Kuh) left in service is 1725 which is coupled to 1662 on route 2. Only a couple of days after I added photos of the all white mirage 1689, and a couple more after it lost its advertising livery, it would appear that the tram is withdrawn and stored in Wollishofen. Possibly it was moved there on the 25th. One wonders whether the work of removing the transparencies was worthwhile. 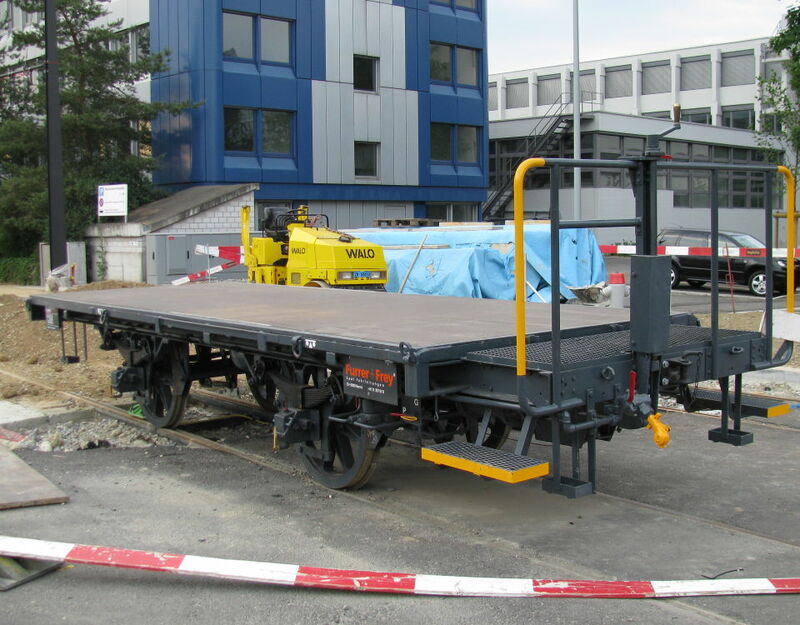 The lastest addition to the fleet is Cobra 3060 which was unloaded from its railway wagon at ZW Altstetten on 29th. Going back to the topic of white trams, the first Cobra in Glattalbahn livery is likely to be number 3062. The advertising GTZ trolleybus 23 was towed to a scrapyard in Waltenschwil, also on 29th. I have added two short series of photos (yesterday and today) with various (mostly) Zürich scenes. According to reports on bahnhofplatz.net, Cobras up to 3059 are now in service. The highest number I have encountered is 3058 (on route 14). Many of the Euro 2008 liveries have not outlived the games by much. The last game was played in Vienna on 29th June, with Spain claiming he title, beating Germany 1:0. That was also the day the EURO-liveried GTZ trolleybus last ran in service. The Carlsberg tram lost its livery on 30th. The red and white Mirages were due to lose their's on 14th July, the airline tram today and the Volkswagen trolleybus on 30th July (bahnhofplatz.net). With new trolleybus deliveries complete, and the EURO tournament over, there is no longer much need for the remaining GTZ trolleybuses of the 2-36 batch. I have seen both 9 and 36 in service in recent days, but their end would seem to be imminent. The driver-training units are not likely to last beyond the end of the year. Meanwhile, the new real-time information displays are becoming more and more widespread, both on-board trams and buses and at stops. Tram magazine (issue 94/05.-07.2008) reports that (at the time of going to press) the following Mirages were stored: 1643+1684 (accident damage) and 1606/12/5/9-20/2/711/23-4. Trailers in store are 789/95-6/8. 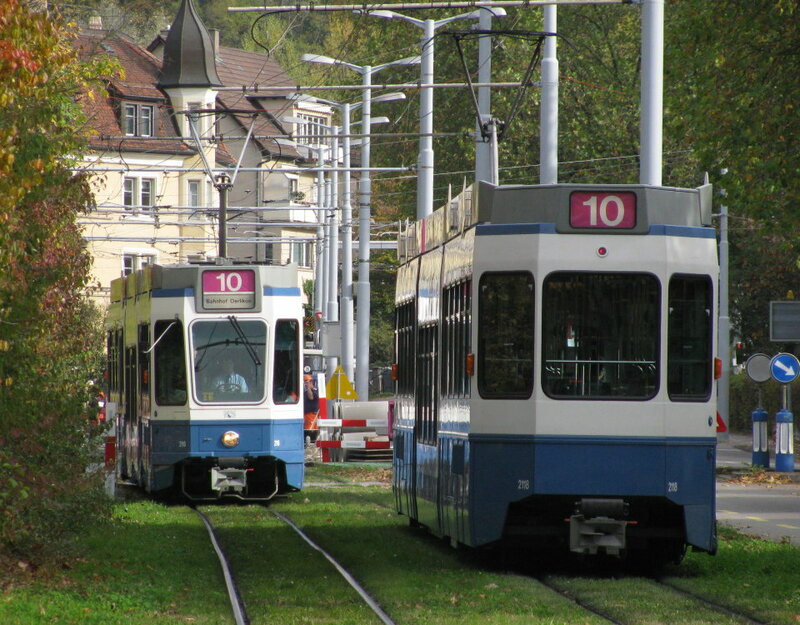 The following trams left Zürich for Vinnitsa in March: Mirages 1601-5/715/8, B4 trailers 786 (Karpfen) 788/91-2/4/7. The following Mirage units have been scrapped recently 1692/4/6/8/701/4/13-4/6/21. The total remaining Mirage fleet is 1607-11/3-4/6/8/21/3-42/44-53/55-60/2-9/71-3/5-9. The only cabless Mirage units still in service are the passenger-counter equipped 1710 and 1725 and EURO-liveried 1712 and 1717. Standard trailer 768 (expo-tram) has been sold to a private buyer in Ziegelbücke. 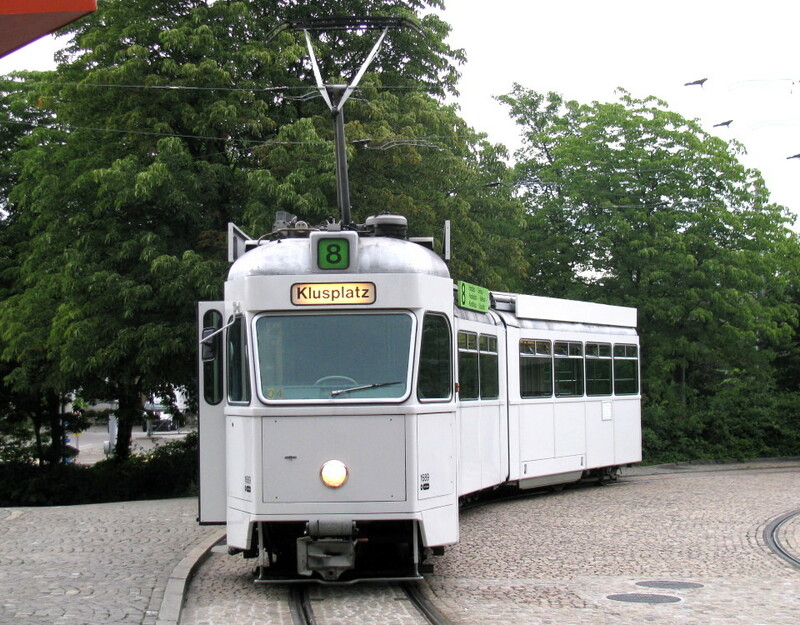 The August edition of Strassenbahn Magazin has a short article on the ex-Zürich trams in Vinnitsa. 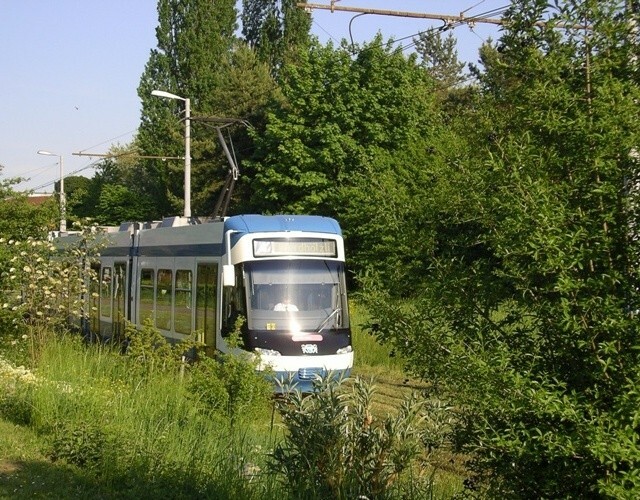 The new owners are said to be so impressed by the blue and white livery that they are repainting their own KT4SU Tatra trams in a similar livery. Contrary to earlier suggestions that cabless units 1715 and 1718 were sent to the Ukrainian city as a source of spares, these are to be run in multiple with cabbed units, in the same way they were operated in Zürich. The article has a photograph of a Karpfen unit in serrvice In Vinnitsa. The tram is equipped with additional marker/indicator lights on the bumper and an electronic matrix route number and destination display. The wing mirror is supported by a very large frame. 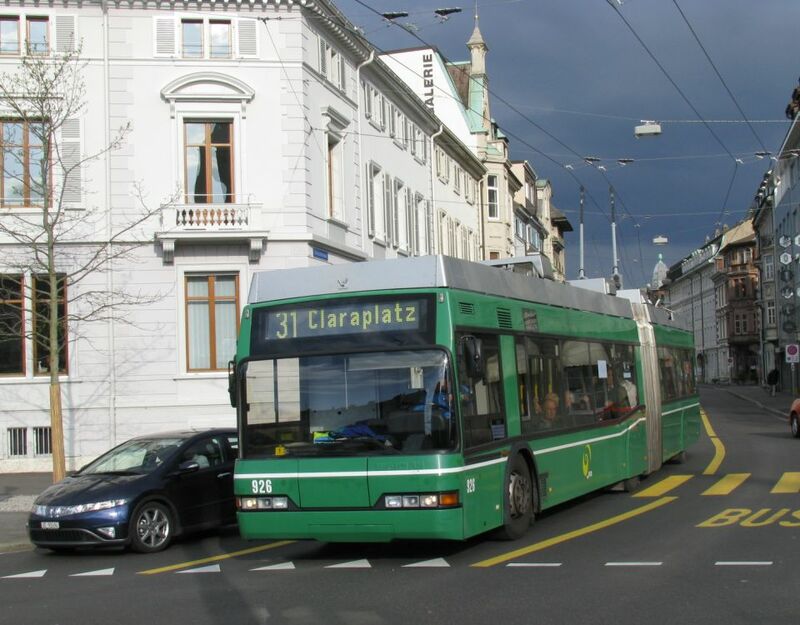 The website trolleymotion.com confirms the joint trolleybus order of Neuchâtel and Lausanne for 55 Hess trolleybuses (20 for Neuchâtel and 35 for Lausanne). Meanwhile the arrival of new Swisstrolleys in Biel mean the entire fleet is now low floor. The withdrawn Volvo trolleybuses will see further service in (Brasov) Romania. 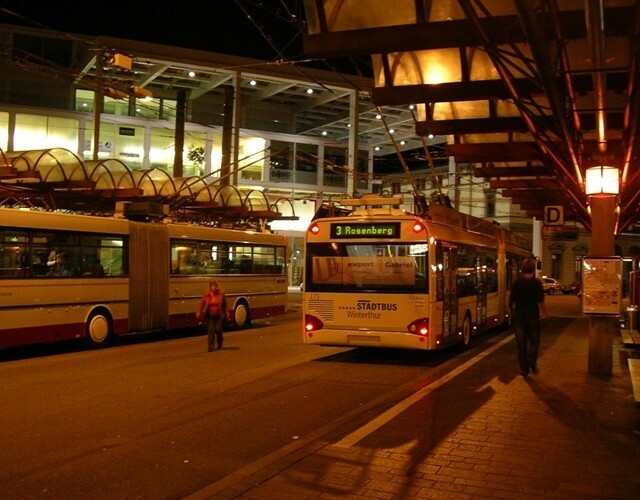 The ex-Basel trolleybuses will go to Sibiu. Apparently their electrics will be replaced there. It remains to be seen whether this is just a promise that had to be made to corroborate BVB's claims of the unavailability of parts, or whether this is a real necessity. Today's 20 Minuten newspaper reports the delivery of the last of the 17 Lightram double-articulated trolleybuses. Reports on bahnhofplatz.net suggest it was already delivered on the 11th, and that 61-76 are all in service. The newest bus in 77. 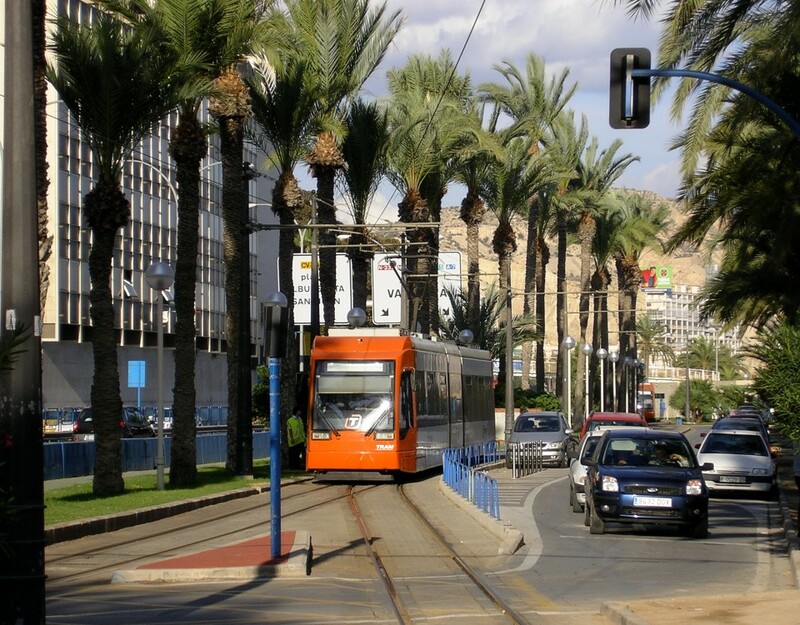 The August 2008 edition of Tramway and Urban Transit (T&UT) includes an article by myself on Alicante's trams. I have added a short series of old postcards to this website. To view these (with my annotations and comparative views), click here. A short article on the Gyrobus, a flywheel-powered bus from the 1950s, has been added to this website. Read the Gyrobus article here. Reports on Bahnhofplatz.net indicate that the unrefurbished Cobra prototypes (3001-5) are out of service and stored in Wollishofen depot. 3005 has since been dismantled. They will be rebuilt similarly to 3006 to bring them up to the standard of the series production vehicles. Deliveries have reached 3057. 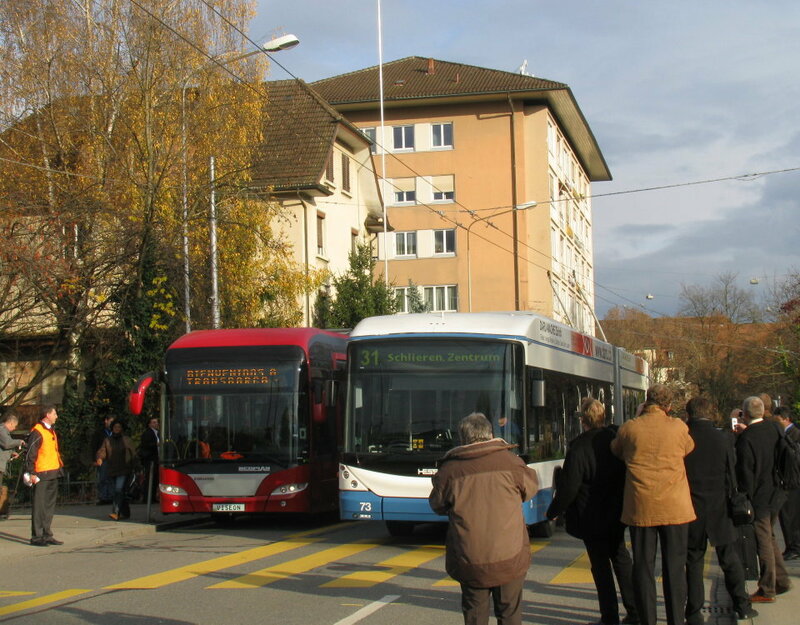 Trolleybus deliveries (Swisstrolley3) have meanwhile reached 75. The conclusion of the European cup (on 29th June) should mean that all remaining GTZ trolleybuses of the batch 2-36 should now be withdrawn. The driver-training specimens should similarly go by the end of the year. The removal of football special advertising liveries has begun. 2087+2428 (Carlsberg) lost its livery on the 30th. The other vehicles are likely to follow suite soon (or face withdrawal). Contrary to rumours that it was to be the first tram 2000 to be scrapped, 2060, which was heavily damaged in an accident in January, is to be repaired. Work is taking low priority however, so it may be another two years until we see 2060 back in service. 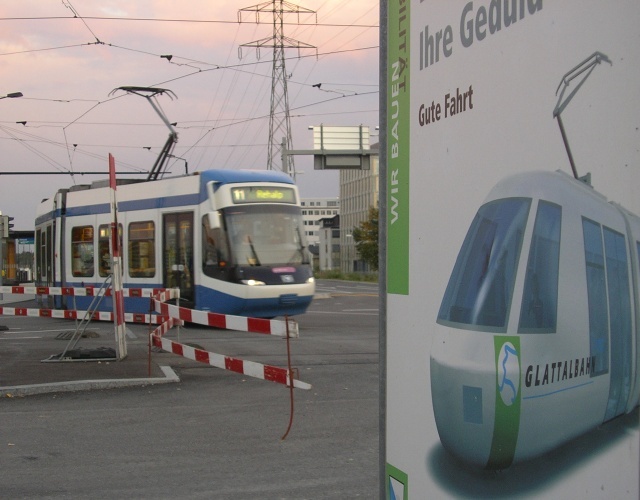 Meanwhile, construction of phase 3 of Stadtbahn Glattal is officially set to begin on 10th July. Work is already in progress on cutting an underpass under the motorway at Auzelg and on preparing the alignment in Wallisellen (a railway siding was dismantled to provide the alignment). I have uploaded a series of photos (index here) including views of the future alignment. I have been a little out of date in reporting news from the enthusiast press. 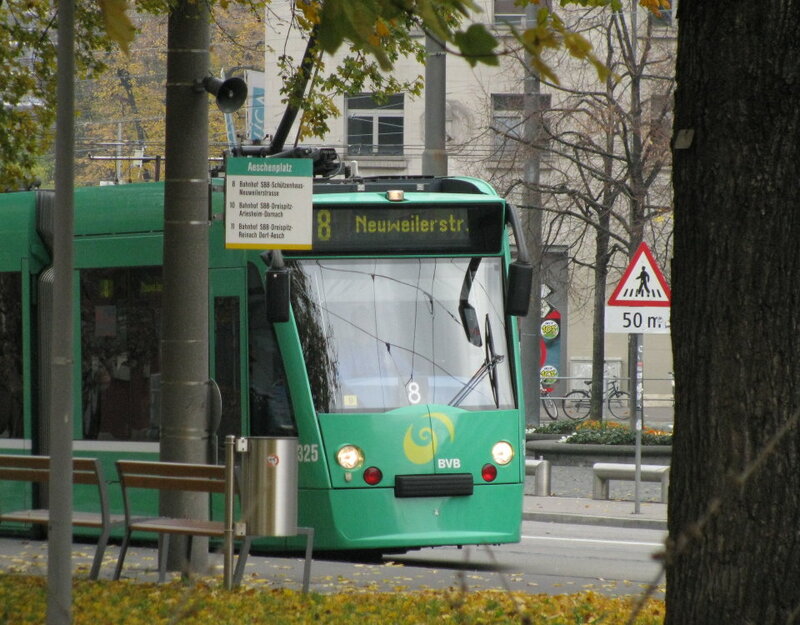 Tram magazine number 94 is now out, but I haven't yet reported on number 93 (02.-04.2008). Mirages 1693/7/9/705/7/19-20. At the end of the year, 1692/4/6/8/701/4/11/3-4/6/8/21/3-4 were stored. The only cabless units (Blinde Kühe) still seeing service were 1710/2/5/7/25. 1420 is probably being used as a source of spares as it left Zürich without its own bogies. 1430 and 785 have been retained in Zürich as a museum set. 786 left for Vinnitsa earlier this year. 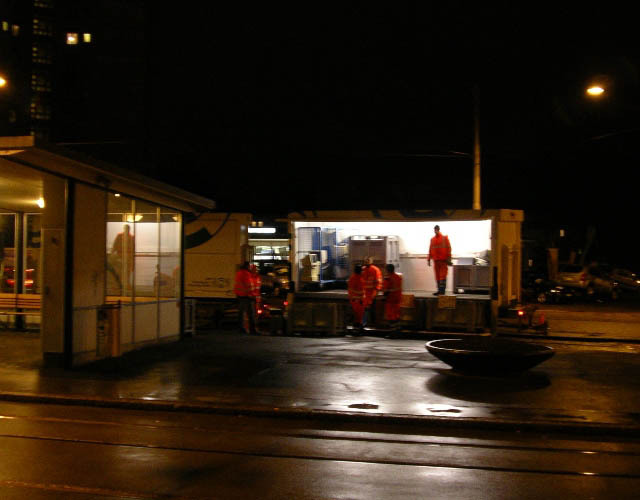 Just a reminder that trolleybus operation in Basel ends today. 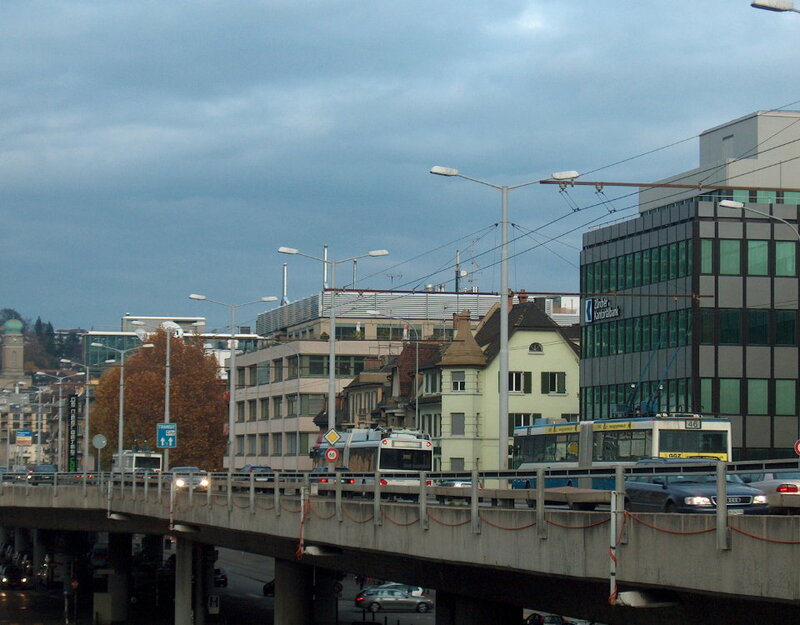 Christopher Leach's Busworld Photography blog has some notable pictures of Basel in the past. 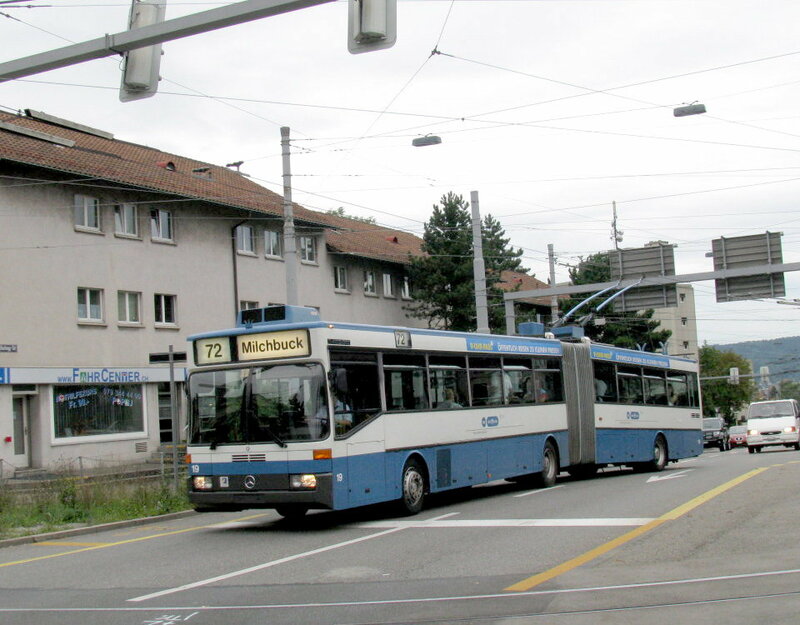 A group has been formed to campaign for the retention of Schaffhausen's trolleybus. The group does not yet appear to have established a campaign website, but an announcement appears on the web of Basel's Pro Trolleybus. The Schaffhausen service is currently truncated at the Neuhausen end due to building work. A fresh conflict has errupted over whether a new roundabout that is being installed should be wired. A study by the INFRAS institute has suggested using diesel buses and compensating the negative environmenatal imapct by non-transport measures. A correspondent informs me that currently only 4 out of 8 vehicles are active and 114 is being cannibalised for spares (following fire damage). I have updated this website with a short series of photographs documenting progress on phase 2 of Glattalbahn. The final touches are currently being added to the track, and work is commencing on the overhead line. Of interest is a wagon belonging to the electrification contractor Furrey+Frey, that despite its good overall condition is probably of considerable vintage. 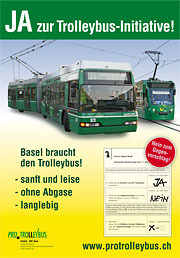 Coming Monday (30th June 2008) will be the last day of trolleybus operation in Basel. 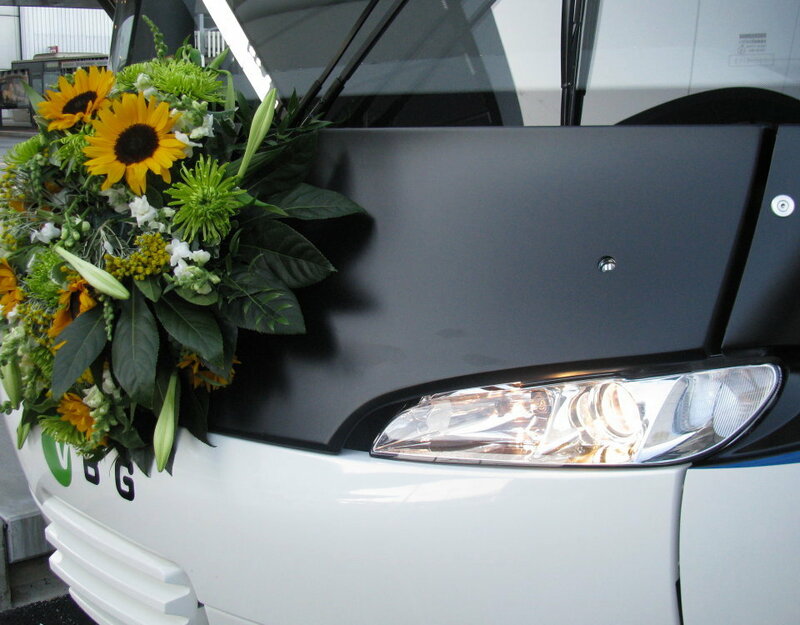 BVB are marking the occasion by decorating two trolleybuses with flowers. These will be the last to run in service, entering Rank depot for the last time at around 20:00. Additionally, two trolleybuses will run on the former route 34 from 15:00 to 19:00. A further vehicle will be parked outside the BVB main offices at Claragraben 55 from 14:00 to 18:00 for public inspection. Opposition against the closure led to the formation of the Pro Trolleybus group, who collected over 7000 signature to enforce a referendum (4000 are required). 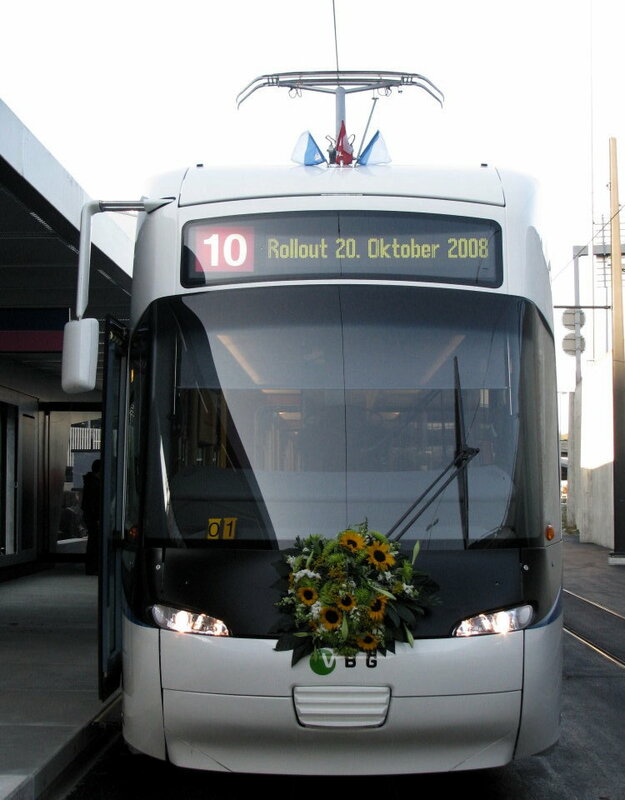 In order to give the alternative a greener face, BVB announced in March 2006 that it was replacing the trolleybuses by buses powered by biological compost gas. Despite having to backpedal on this, admitting that the buses would use normal natural gas, the green label stuck and the referendum of 17th July 2007 scuttled all hopes of saving the ailing system, with 53.7% voting against retention. Latest news suggests that the trolleybuses will see further service in Romania. The advanced electronics may be replaced by something more basic. 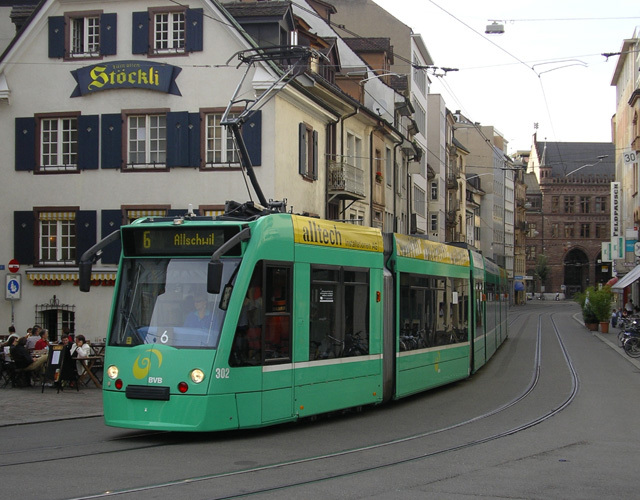 The current (July dated) edition of Tramways & Urban Transit features a fact file on Freiburg by Michael Taplin and myself (to be honest, my own contribution was minimal). The UEFA cup is far from over yet, but the last of Zürich's three matches was played on Tuesday night (Italy beat France 2:0). I have added a short series of photos (and a film) to this website. I have added some photos of our recent Alicante trip. On the 2nd June we experienced the switchover from diesel to electric operation between Creueta and Benidiorm. A map can be downloaded here. 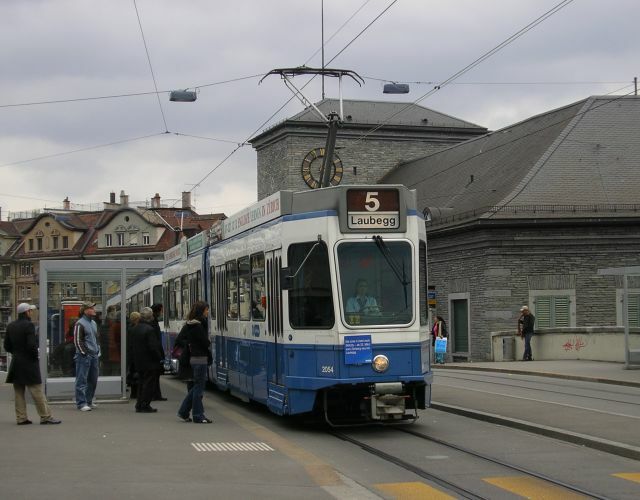 The opening of Tram Bern West in 2010 will see Bern's tram system re-organised as follows (through tram lines): Brunnen/Betlehem to Saali (present route 3) , Bumpliz to Ostring (present route 5). Today's route G will be extended to Fischermätteli via Bern Hauptbahnhof. Bernmobil will take over the operating resposnibilities of this line from RBS, but RBS will operate the line under contract. RBS Be4/8 Tram 2000 units 81-89 that currently operate this route will be strectched to Be4/10 units through the addition of low floor sections. 8 Combinos will also be stretched from Be4/6 to Be6/8 and 21 further Be6/8 units are on order. The sixth football livery has now been applied to Mirage 1689. Following the withdrawal of the sponsor, the livery is now a general purpose one. The same livery has also been applied to trolleybus GTZ 23. The advertising of alcoholic beverages on public transport is forbidden, and Carlsberg had to point out that their tram specifically advertised the non-alcoholic version of their beer, although the fact only becomes apparent when one looks at the small print on the tram. The mystery of the sixth livery has meanwhile been lifted. The sponsor, Tally Weijl (a fashion shop) withdrew from the deal following critiscism that their planned livery was too lewd. The same livery has, however, been applied in Basel (BLT Be4/8 250) – apparently without there having been a similar problem. The tram would have featured (pictures of) scantily-clad women making ambiguous remarks with unambiguous undertones. As a result, 1689 is still running in an all-white livery. It has been joked that it could be transferred to VBG as a first vehicle for Glattalbahn. 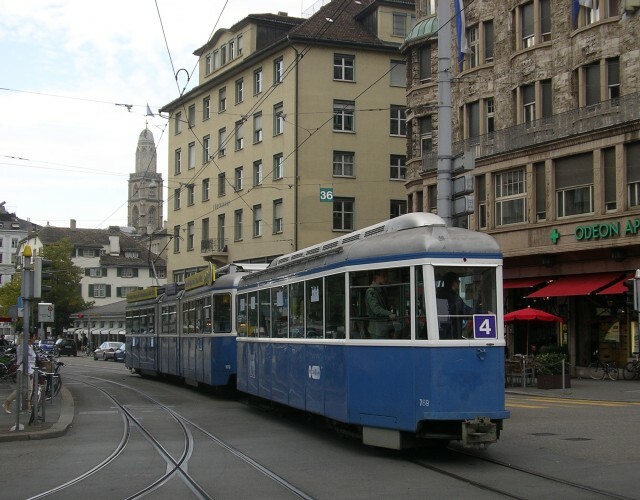 The cantonal parliament has rejected the planned tram extension to the zoo by 72 to 55 votes. A referendum will however be held. Besides the costs (claimed to be 27 million), the main reason for the opposition is the loss of 114 parking spaces. Alternatives suggested include a bus shuttle, a multi-level car park and the planned aerial cable car from Stettbach. The latter option is favoured by zoo management. Biel is currently replacing 11 Volvo trolleybuses (nos 62-72) of 1985-89 by 10 Hess Swisstrolleys (51-60). Pictures of withdrawn Volvos being loaded onto railway wagons for their journey to Romania can be found on www.bahnforum.org/index.php?page=Thread&postID=231415 . See also this website's trolleybus pages. I have uploaded a report on my recent USA trip, and an accompanying series of photographs. Neither is exclusively dedicated to trams, but feature a high prevalence of tram pictures and observations. 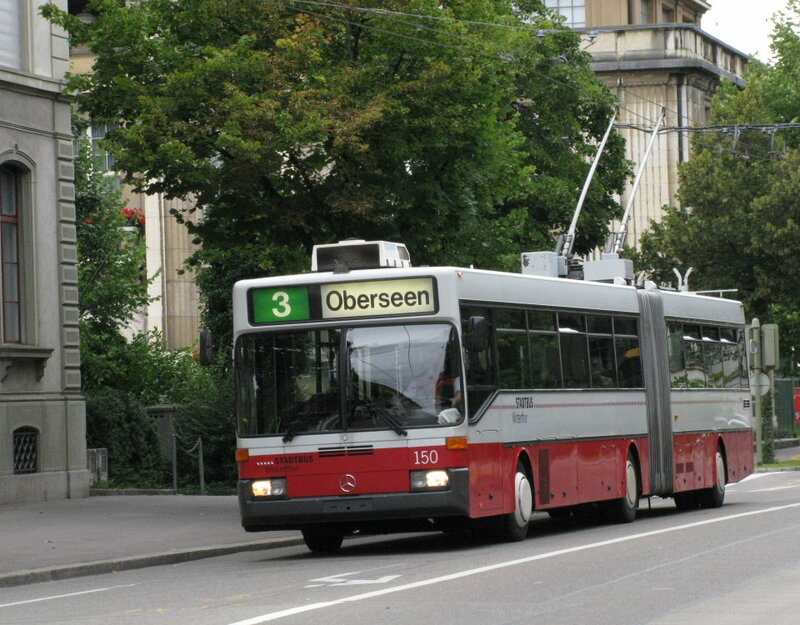 16 Hess Swisstrolley3 trolleybuses have been ordered by Luzern as replacement for vehicles dating to 1989. I have just returned from a combined business trip and vacation in the USA, visiting Houston, Philadelphia and Dallas. A report on this will be added to this website later, as will any important Zürich news items I may have missed. The first of Basel's new gas-powered buses (not powered by compost gas) is arriving end of this month. 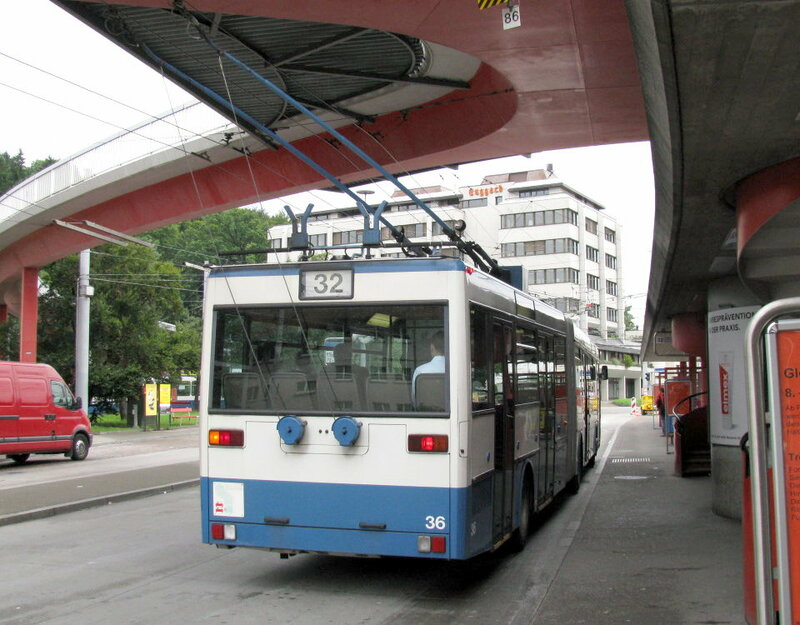 Trolleybus operation in Basel will cease by the end of June. The petition for returning trolleybuses to Wintherthur's route 4 has been presented to the city council with 810 signatures. VBZ is to install more than 150 digital information displays at 57 of its stops over the next 12 months. 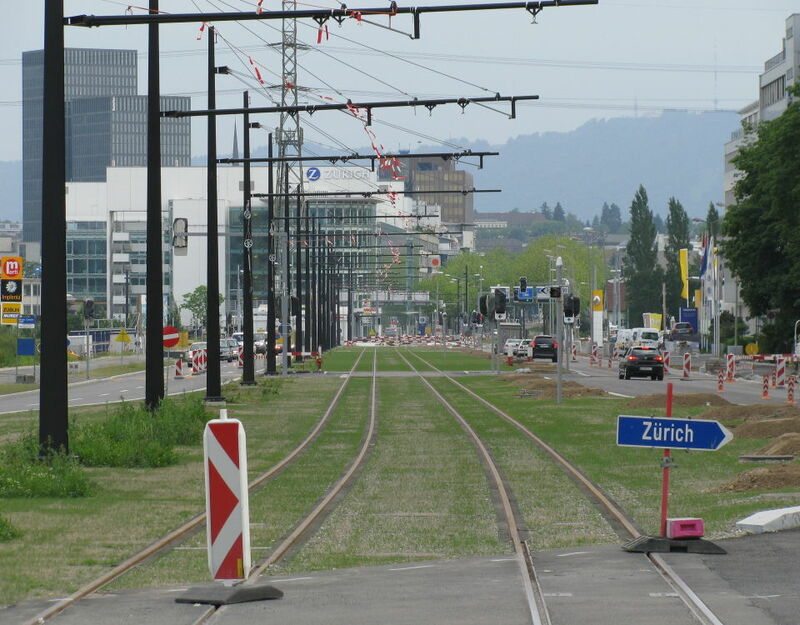 According to the NZZ newsppaer of 11th April, construction of Tram Zürich West is set to begin on 9th September. A correspondent has emailed me pointing out a tram accident I missed. On the early morning of April 4th, 2014 (ex-depot for route 15) ran into the back of 1643 (on route 13) at Dammweg. The Mirage is almost certainly a write-off, having suffered significant deformation. The following GTZ trolleybuses have been withdrawn: 21/6 (im March) and 7/16/27/31 (in April). The lowest-numbered trolleybus remaining is number 9. 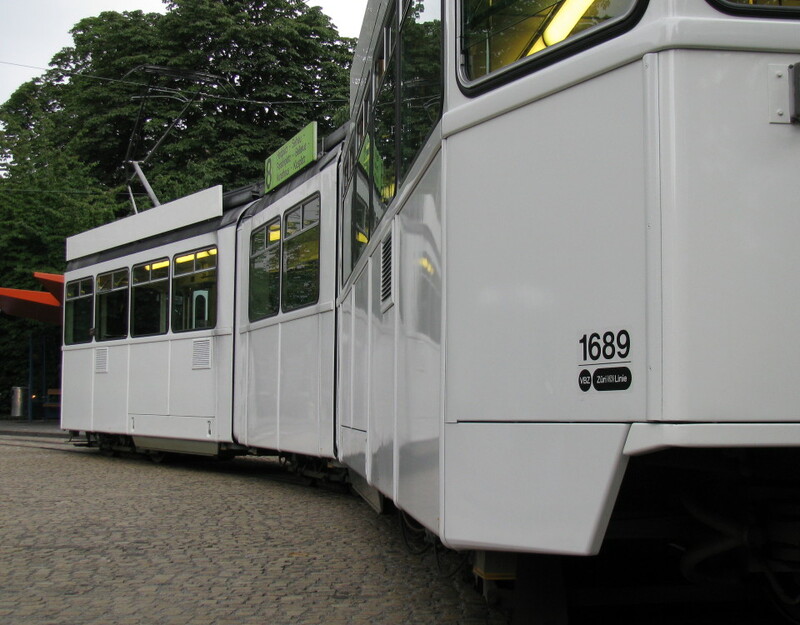 The fifth Euro-2008 tram, 1689, is still running in white. It is speculated that the sponsor for its intended special livery has withdrawn. The use of dynamic displays rather than fixed roofboards to indicate a tram's route are bearing first fruits, with Cobras from other routes helping out off-peak on route 2. For a more complete trolleybus fleetlist, see this website's fleet listing. 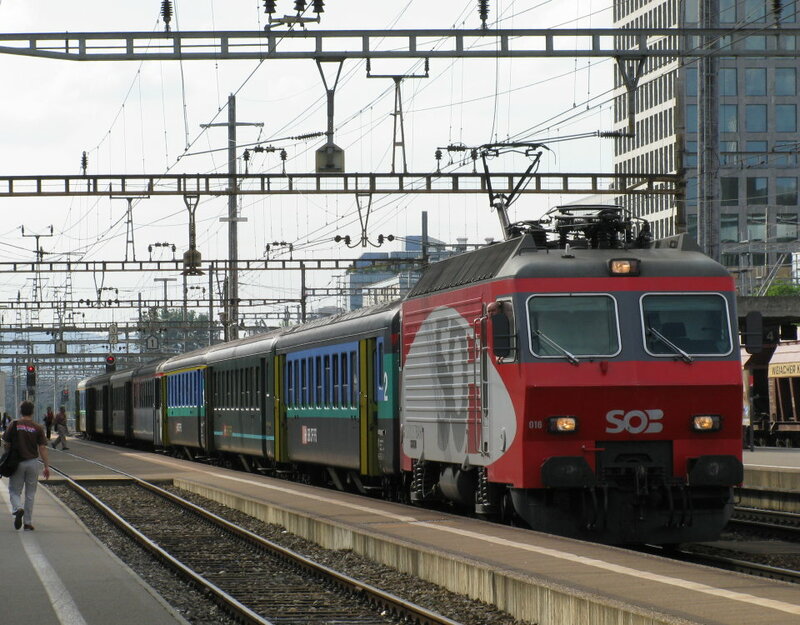 In Basel, things are looking up again for the cross-border line to St. Louis, with the Communauté de Communes des Trois Frontières having launched a study for the extension of route 3 via Bourgfelden to Saint-Louis station for opening in 2014. 15.04.2008 - Happy birthday Cargotram! The date has gone largely unnoticed, but today is the 5th anniversary of Cargotram's debut. See also this website's cargotram index page. The visitor count on this newslog has passed the 30,000 mark! Thank you to all visitors who keep it popular! 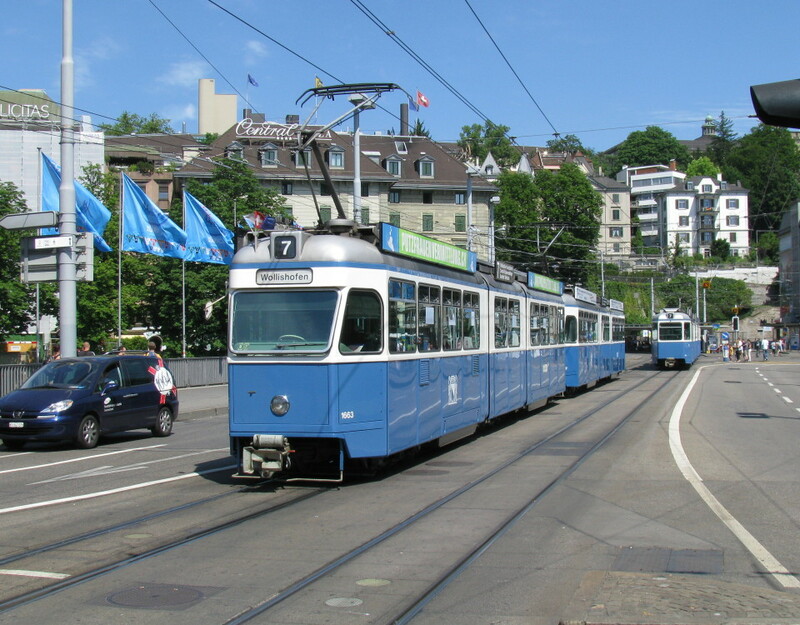 An impressive series of pictures documenting Mirage trams leaving Zürich by rail for Vinnitsa can be found on this page of www.pft-zh.ch. This website has been updated with various new items. My article on the new tram museum at Burgwies, published in Tramways & Urban Transit (T&UT) in October 2007 is now available online (see also announcement of 17.09.2007). 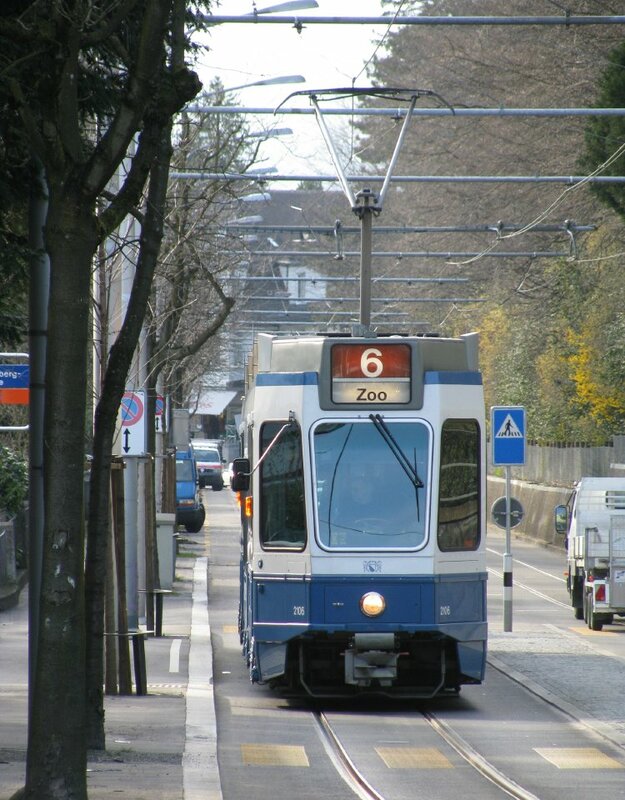 Also, in response to a contest being run on the Eurotrams Yahoogroup to determine the world's best tram rides, I have written a contribution on Züich's tram route 6. The photo gallery is also updated. Besides containing many of the pictures (and related views) used in the route 6 article, there are many photos taken during my recent visit to Augsburg (mostly GT4s). Related links: LRTA (publisher of T&UT), Eurotrams Yahoogroup. Six B4 trailers (including the Karpfen trailer 786) left Zürich for Vinnitsa (Ukraine) by rail on 28th March. On 1st April these were followed by Mirage 1602/3 and 1718 (contradicting earlier indications that no cabless units were being sent). 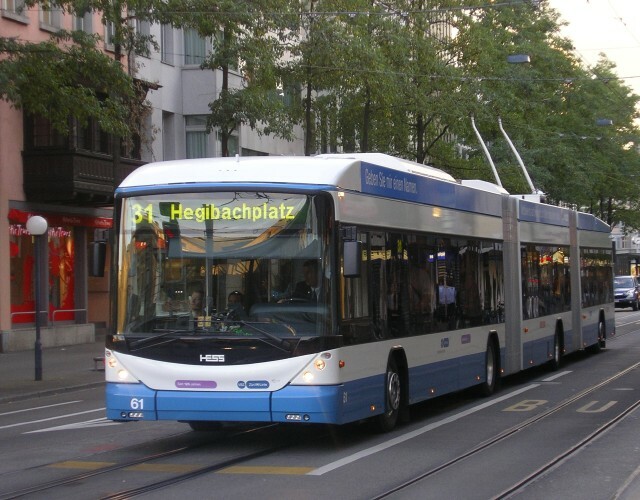 Hess's Lightram hybrid demonstrator (basically a diesel-electric version of the double-articulated trolleybus that uses supercaps to store regenerated braking energy) is in Zürich today and tomorrow and running in public service on route 31 (registered ZH 741073). 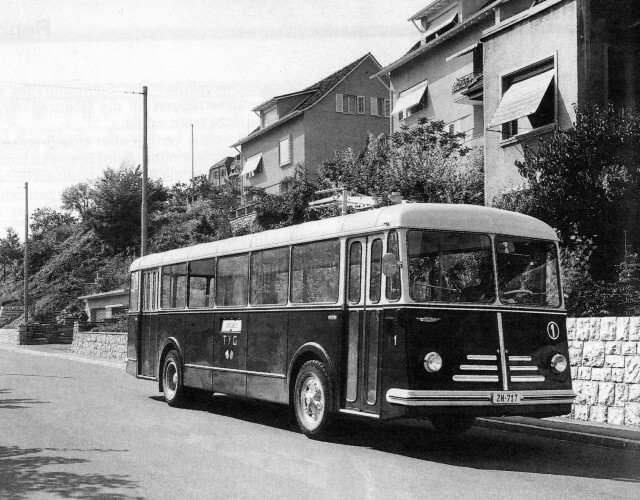 More on this vehicle can be read on this page of Stadtbus.de (in German). 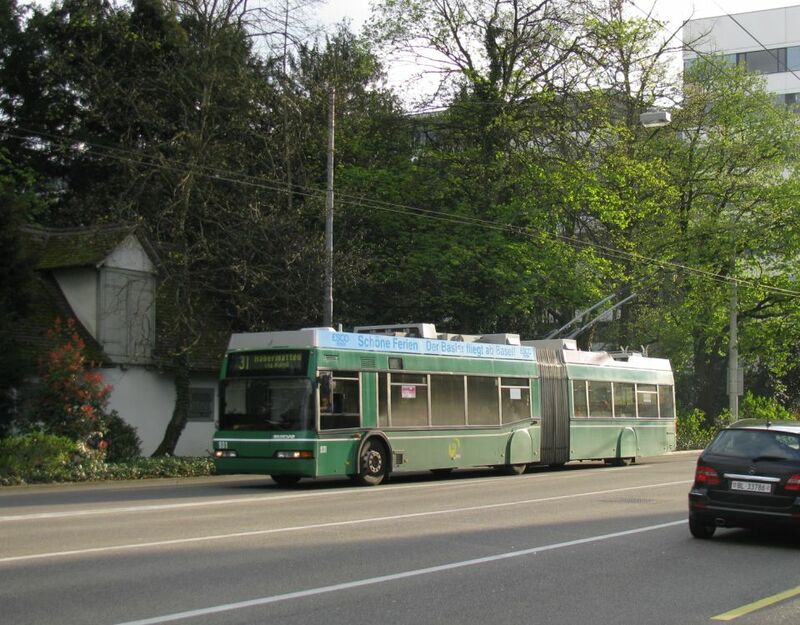 Following January's decison to retain trolleybuses in Winterthur, a petition has been launched to return trolleybuses to the long-dieselised and partially dismantled route 4. Information and forms can be downloaded from www.schumm.ch/ trolley. As far as I can make out, you don't have to be a local to sign. 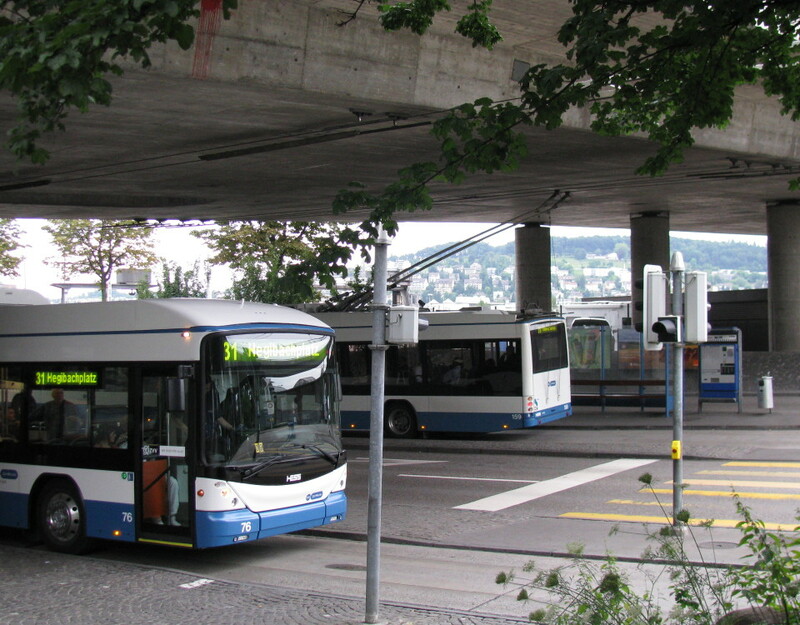 route 4 (+9.2% to 19.1 million), together with route 13 (+2.7%), this route serves the rapidly developing Zürich West area. Evening frequencies (after 20:30) on all routes to be shortened from 12 to 10 minutes on Fridays on Saturdays. On Sundays to Thursdays the same is being stretched from 12 to 15 minutes. On working days between 7 and 8:30 and 16:30 and 18:30, intervals will stretch to 7.5 minutes. Passenger statistics show that trams should be able to cope with the increased loads at peak times. In the case of route 3, the Tram 2000 + pony sets will be replaced by Tram 2000 + Tram 2000 sets. Route 6 will retain its present peak headway, and a peak-only relief service will be worked between Hauptbahnhof and Escher Wyss Platz at 7.5 minute headways. 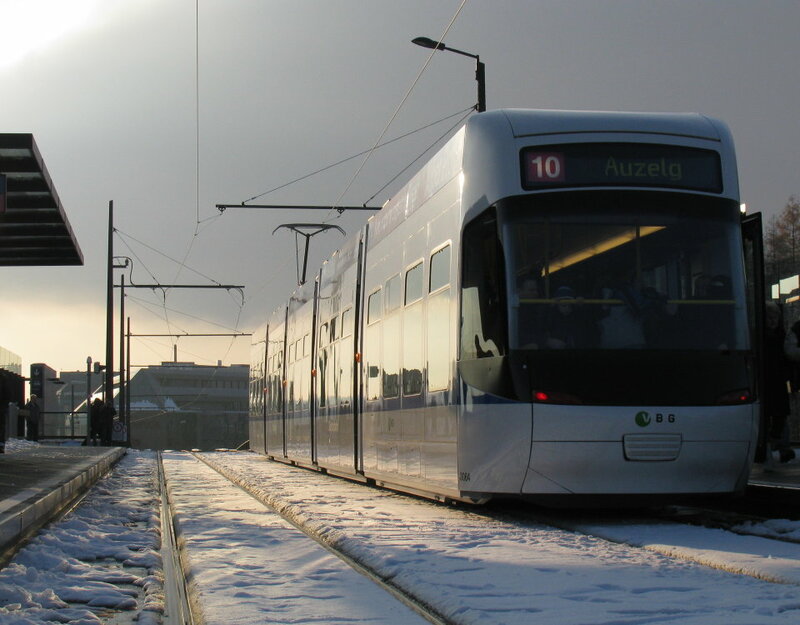 This route will operate until Tram Zürich West opens in 2011. Rather unimaginatively, these trams will not be allocated a route number but display E in their route boxes. These changes will increase operating costs by some 2 million Franks. VBZ hopes to obtain another 4 to 5 percent more passengers as a result. Routes 6, 10 and 12 will thus have low-floor trams on all services, 5, 8 and 15 will remain all high-floor and the other routes will have a mix of about 50% of each. The first Cobra to be delivered in VBG (Glattal) livery will be 3062 (due to be delivered this autumn). VBG will take over the operation of route 10 from this December's timetable switch, coinciding with the route's extension to the airport. VBG will also operate route 12 (Airport to Stettbach) from its 2010 opening. VBZ will retain route 11. Unmodified Cobra prototypes 3001-5 are currently out of service and stored in Wollishofen depot (probably to be replaced or rebuilt[?] to series specifications). 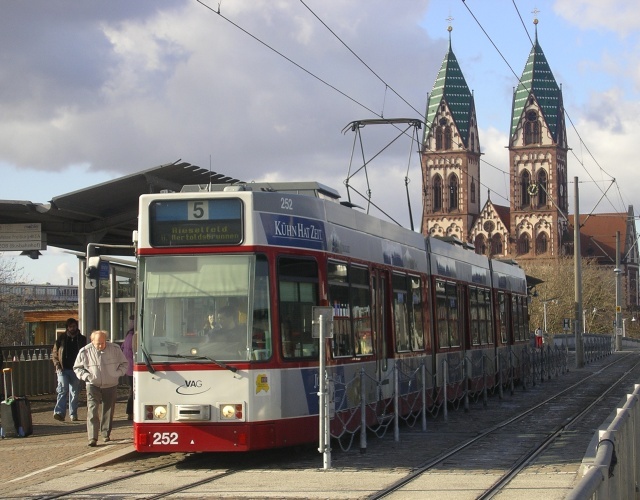 Weil's council approved the cross-border tram extension from Basel on Friday with a surprising majority of 22 votes to 10. Construction should begin later this year. Weil's contribution to the project is 5 million Franks. Baden Württemberg is paying 15 million and the Lörrach region (Landkreis) 1.6 million. On the Swiss side, Basel is paying 42 million, BVB 1.6 million and the Swiss federal government is contributing 43.6 million. 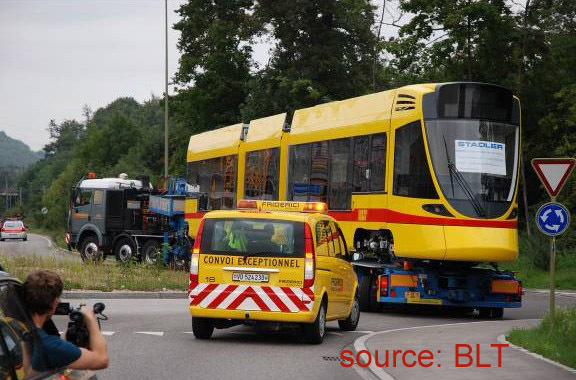 BVB's Combino trams must undergo certain minor modifications to make them conform to German regulations. Freiburg will be supporting BVB in implementing these. 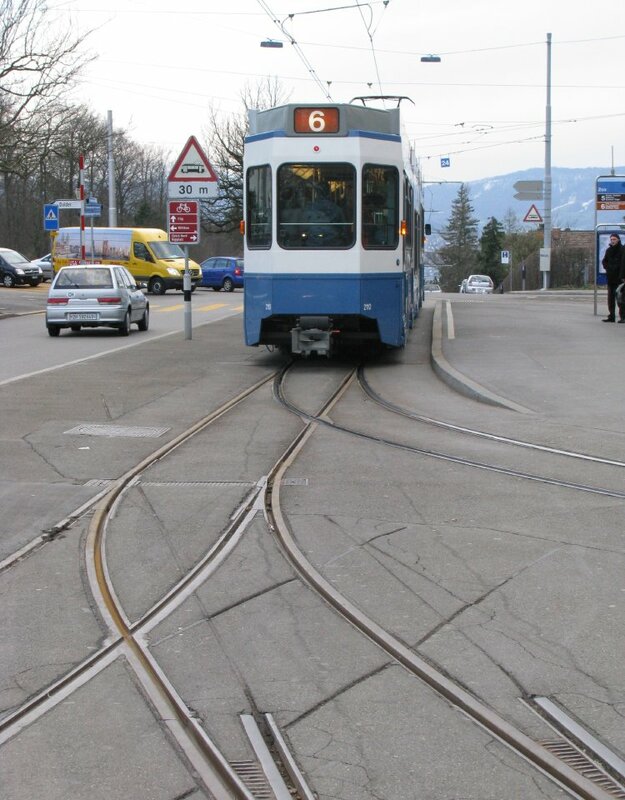 The most visible difference will be the fitting of rear brake lights, which trams are not required to carry in Switzerland. Seen yesterday as Einsatztram, Mirage 1675 fitted with matrix displays fitted to side windows. The end displays were still of the conventional type. 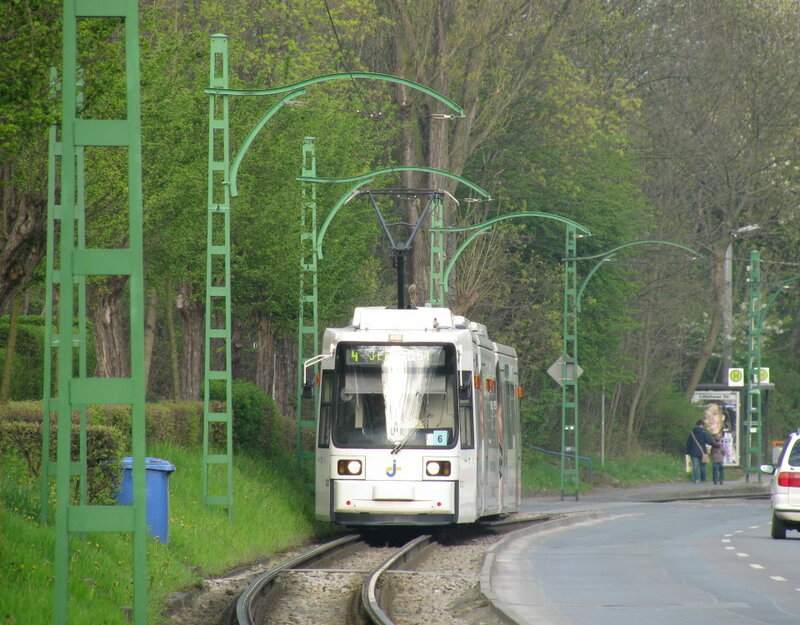 The Einsatztram is a spare tram that normally waits with a driver in the Gessnerallee loop near Hauptbahnhof. It can be called upon at very short notice to fill any gap on any route when delays or irregularities occur. The need to change route numbers and destinations quickly mean automatic displays make sense for this tram. Until the mid 1990s, the articulated prototypes 1801 and 1802 were used on these duties. These and the corresponmding trailers 786 and 801 were specially fitted with Tram 2000-style large route number boxes and automatic destination films. The replacement of these sets by single mirages was a step backwards in terms of customer information as the side-mounted roof boards read simply "Einsatzwagen" and only the front display could reasonably be operated by the driver. The latest modification remedies this deficit (with the exception of the rear display). It is however surprising that a members of a type that is essentially on its way out is being treated this way. The city executive council has rejected a motion by two members of the Social-democrat party (SP) for the electrification of bus routes 67, 69 and 80. The rejection was justified on cost grounds. 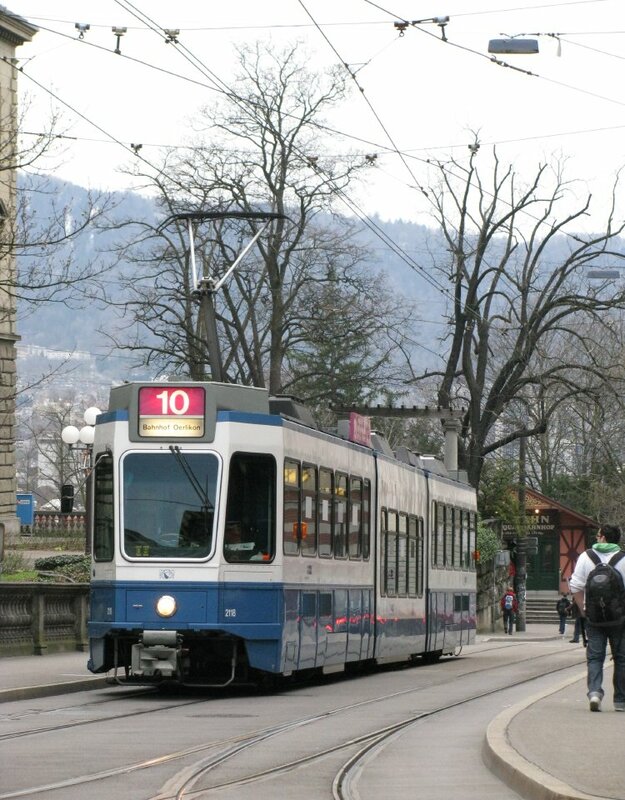 This weekend, a referendum in Geneva rejected with 67.2 % against the proposal to make public transport free in Genève. 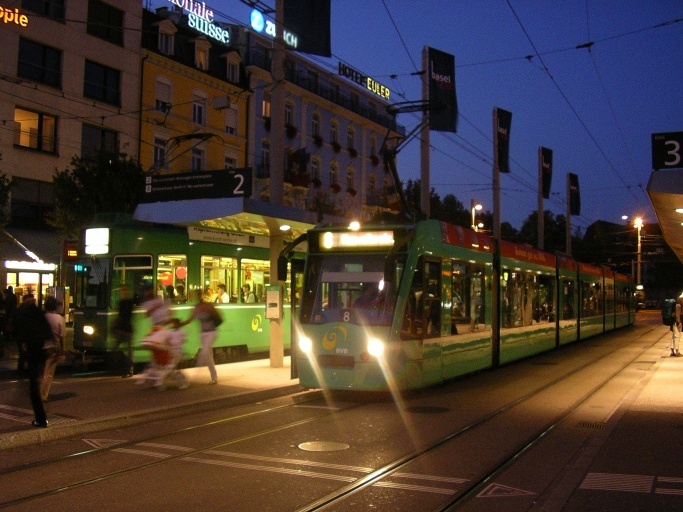 Various left-wing parties had raised the proposal of abolishing all public transport fares in Geneva, arguing that this would encourage more motorists to leave their cars at home and use public transport. Website comment: Although I am very much in favour of measures that increase public transport ridership, I am happy this was rejected. For most people, public transport is cheaper than driving anyway, so costs are obviously not decise in keeping people away from public transport. On the other hand, abolishing fares makes the operator more dependent on subsidies, and hence on the political whims of the governing majority which can and does change over time and even when well-meaning, does not always understand the needs of a public transport system. Also it would remove the operator's incentive to be as attractive and customer-focussed as possible while making it more difficult to keep undesirables out of public transport. The latter would have a counter-productive effect of on the non-captive segments of the ridership. 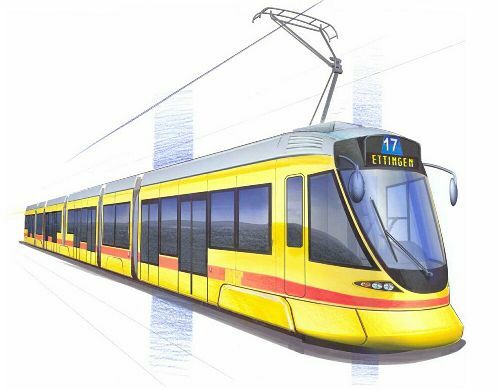 Achieving progress on Basel's cross-border tram project for an extension to Weil in Germany is proving a bumpy ride. 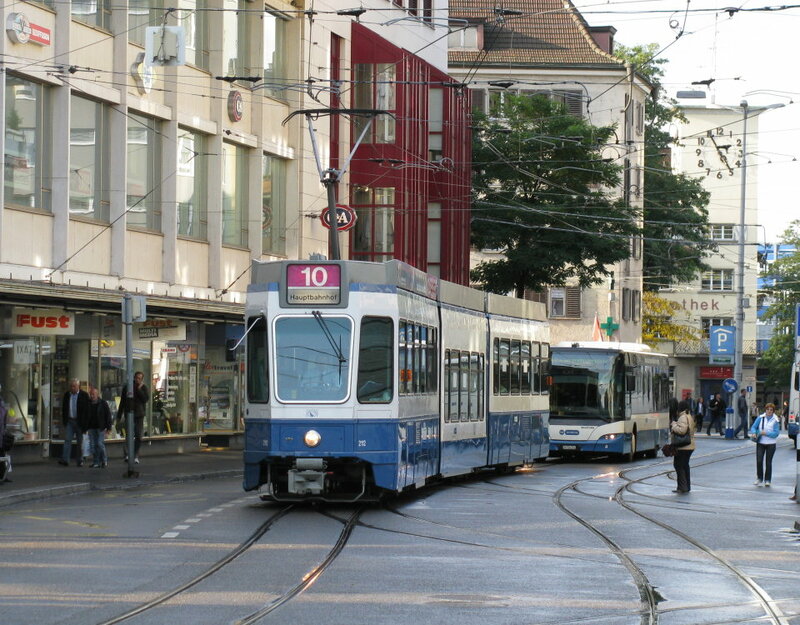 Basel's neighbour wants the tram in principle but doesn't like the idea of paying for it. At least this is the impression one can get from following this epsiode in the media. 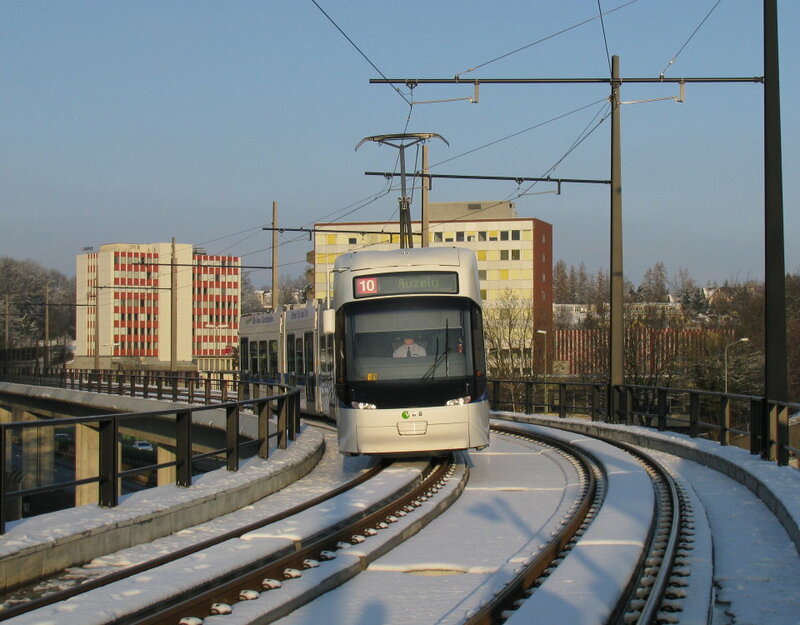 Back in 2005, Basel's tram extension strategy included three cross-border lines. In September 2006, the federal government agreed to finance (the Swiss sections of) these to 50%, on the condition that work started by the end of 2008. The two French proposals, however, were met with lukewarm enthusiasm, leaving only the Weil project with any realistic chance of being under construction by this date. Weil too, however, was slow to warm to the project, especially as the need to replace a bridge drove up the costs of the German section from 33 to 45 million. However, Basel is offering to pay 4.5 million directly towards the German line. Weil (with the support of the provincial and national authorities) must finance 21.6 million Franks compared to 42 million by Basel and 1.6 million being contributed by BVB. The federal contribution is 43.6 million (thanks to some of the moneys released by not building the French lines being redirected). Despite this exceptionally generous offer, Weil is still concerned about the costs. The latest argument being the question of cost overuns. Basel is now offering to earmark 3.2 million for this. This, it is understood, is the greatest possible compromise, and failure to reach an agreement on this basis would probably end the dream. Update: (21st February) Baden Württemberg (the Land in which Weil lies) will contribute 9.65 million Euros to the project. This is the highest possible contribution they can make (75%). This is in recognition of the high contribution made by the Swiss side. The Landkreis Lörrach is contributing 1.6 million Franks. Weil must now finance the remaining 3.1 million Euros. A decision is due next week. The total project is costing 104 million Franks. BVB's Wiesenplatz depot is to be rebuilt for 45 million Franks. This is the depot that was ravaged by fire in 2004. The project will change the depot from a stub to a through-running layout, saving an estimated half million Franks annually. The amount of covered tracks will also increase, reducing noise for neighbours. The main shed building, which is a listed structzure, is being retained. 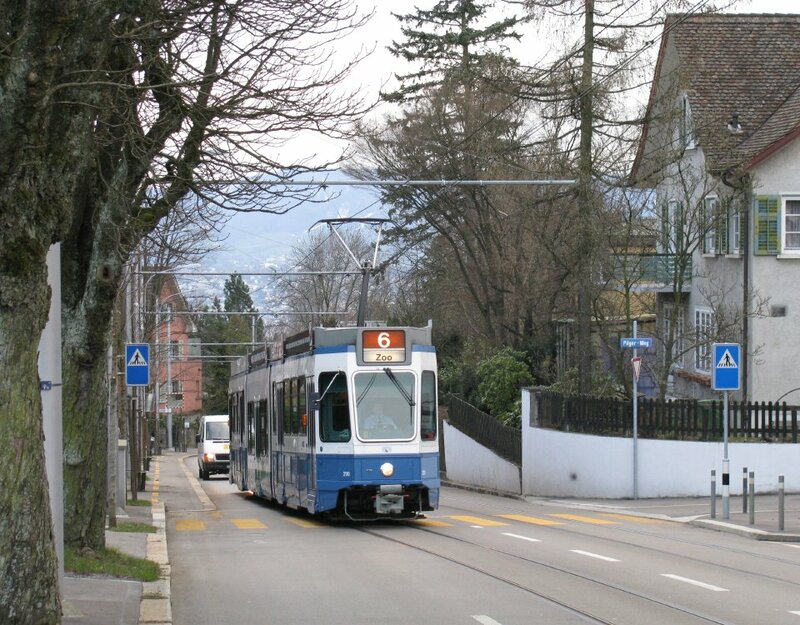 The proposed Stadtbahn Limmattal tram/LRV corridor between Zürich Altstetten and Killwangen is taking another step forwards with the cantonal authorities now taking the necessary steps to safeguard the alignment. 11.02.2008 - Are Cobras too silent? Following many complaints that Cobras are noisy (at least for the passenger), it now seems they are also too silent (at least for pedestrains and car drivers). 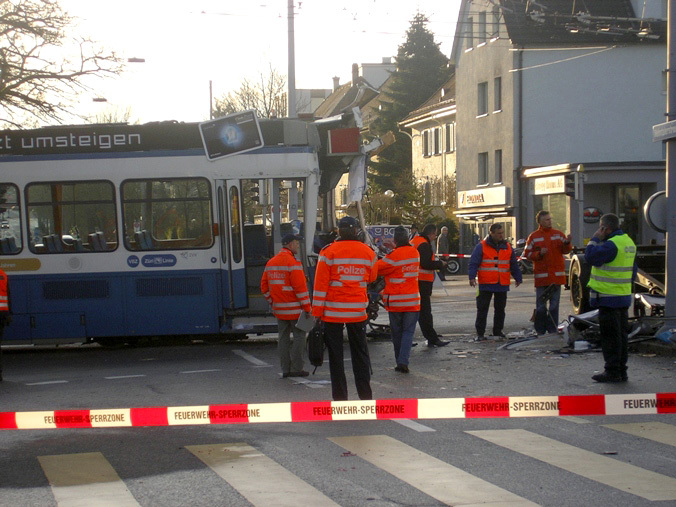 According to an article in the Friday edition of the free newspaper, 20 Minuten, the number of accidents involving trams has risen by 39% in 2007 (compared to the previous two years). Furthermore, three of the six traffic fatalities of 2007 involved a tram. 90 percent of accidents involving trams are caused by motorists not respecting tram priorities. A VBZ spokesman said that it had not been proven that the increasing number of quiet Cobras was resposnible for this increase. He did, however, say that trams are getting quieter, both thanks to the Cobras and to lubrication cutting down on squeal in curves. This website has not reported on progress on the construction of phase 2 of Stadtbahn Glattal since September. With the opening now less than ten months away, the last elements are beginning to fall into place. Track is now complete from the junction to phase 1 at Glattpark as far as the mouth of the subway at Lindbergh-Platz, but has still to be ballasted. Landscaping along this section is also making rapid progress (as indeed is construction of buildings on the adjoining land). The tunnel itself does not have any track as far as I could see. Track starts again at the other end (Bahnhof Glattbrugg) however and stops a short way before Unterriet. Further track is being layed in the airport area. The airport viaduct appears to be structurally complete, with the interchange at Balsberg also rapidly taking shape. No overhead masts have been placed yet as far as I could see at any point of the route, but their foundations appear to be ready throughout. With Cobras increasingly displacing Tram 2000 sets from route 14, the latter type are now being redeployed on route 13. This leaves route 2 as the only route to be all-Mirage worked. Cobra deliveries have reached 3049. 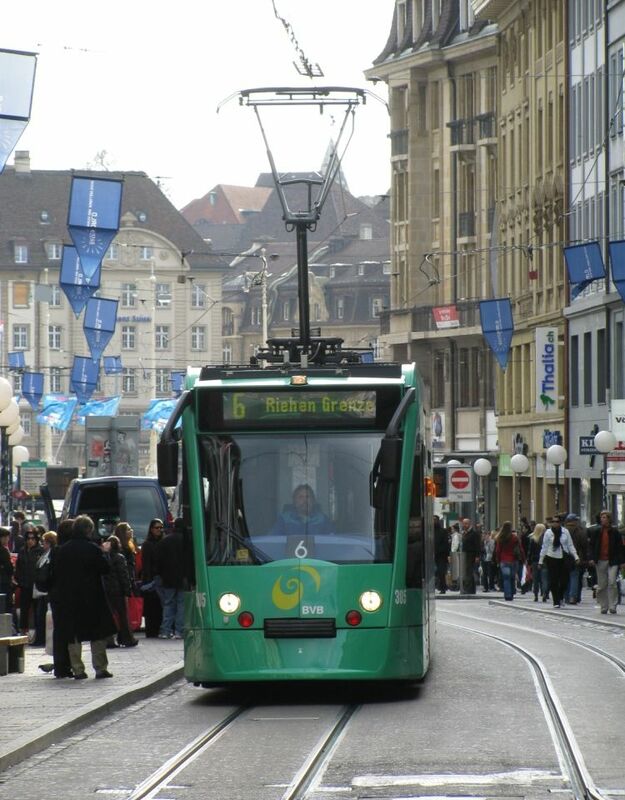 A tram has been proposed for Lausanne. The line would connect Bussigny — Renens — Flon and could be open in 2015. 29.01.2008 - Do you speak tram? You may have heard about people learning languages on the tram, but it is much rare to see them take their teacher with them! From today to 1st April, VBZ's Partytram (1330) will be rolling through the streets every Tuesday between 12:00 and 13:15 offering lessons in Arabic, Chinese, Japanese and Russian (only one language per trip). The rolling classroom seats 16 pupils and starts at Usteristrasse. One lesson costs 30 Franks including lunch. The unusual service is a promotional offer from Migros Kulbschule. The town of Winterthur has decided to retain its trolleybus system and to spend 24 million Franks for the replacement of 21 trolleybuses. The decison was based on a study by the INFRAS institute, which showed that abandonemnt could save between 0.8 and 1.4 million Franks annually, but recommended against this for ecological reasons. 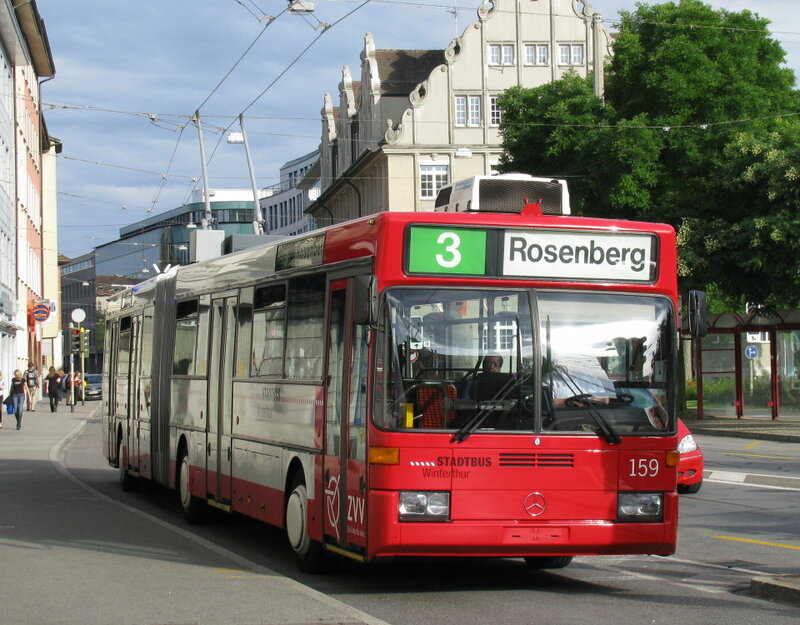 Winterthur currently has three trolleybus routes (1 T�ss — Oberwinterthur, 2 Wülflingen — Seen and 3 Oberseen — Rosenberg). 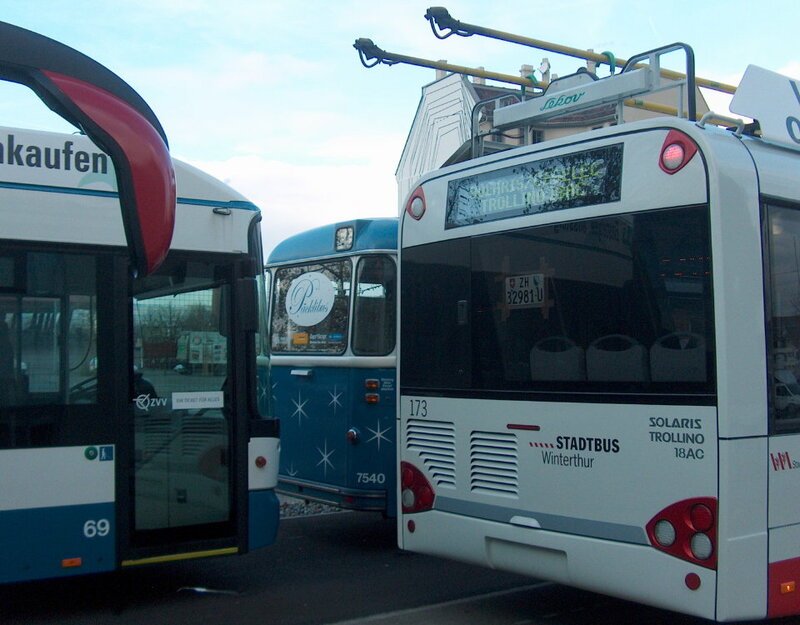 The fleet consists of 31 vehicles, of which 21 Mercedes/ABB O405 GTZ delivered from 1988 (nos 141-161, these are the ones to be replaced) and 10 Solaris Trollino 18AC delivered in 2005 (171-180). According to bahnhofplatz.net, Cobra deliveries have reached 3047. 3003 is being prepared to be returned to Bombardier by rail. This would make it the second of the prototypes (after 3006) to be rebuilt to series specifications. Trolleybus deliveries have meanwhile reached 65. A correspondent also reports sighting trolleybus 31 in service on route 32, meaning this vehicles is either reinstated or the earlier report on the July report of its withdrawal innaccurate. See also this website's trolleybus fleetlist. Tram magazine (issue 92/12.2007-02.2008) reports that 3041 was the first Cobra to be equipped with surveillance cameras from new. Earlier Cobras are being retrofitted. Mirage numbers 1695/703/9/22/6 have been scrapped (all cabless units or Blinde Kühe). 1709 was one of the units used in a road safety film last year. This leaves only 11 Kühe in service (1716-18/23/5 on route 2, 1724 on route 7 and 1710/2-5 on route 13). Kühe 1692/4/6/8/9/ 701/5/7/11/20 are stored in Wollishofen depot and 1693/704/19/21 in Altstetten workshops. Meanwhile the following Mirages were overhauled: 1675/7 (R.A.) and 1717 (S.K.). 1687/9/712 are to follow with S.K. This year's Cargotram timetable (see www.erz.ch) shows that Tiefenbrunnen will not be served until July due to building work. 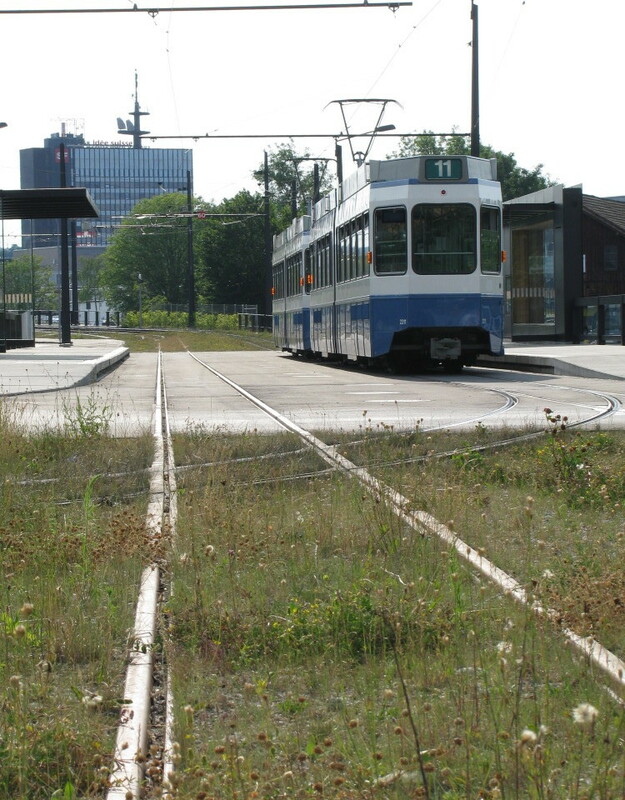 Also, Laubegg, where a lorry had susbstituted the tram since March 2007, has now lost the service altogether. In total, eight destinations are now served; once a month as Cargotram (for collecting bulky items of rubbish) and once as E-Tram (for collecting electronic waste). The count will return to nine when the Tiefenbrunnen service resumes. See also this website's Cargotram page. A litte bit off-topic, but Hess and Kiepe have developed a hybrid variant of its LighTram (double-articulated) trolleybus, sharing a considerable number of common parts. Through this synergy, the success of such a design may help make trolleybuses more affordable. It may also, however, threaten existing trolleybuses operations if misguided politicians see it as yet another "almost as good but cheaper" alternative. This article (in German) on stadtbus.de describes the vehicle, which basically has a diesel generator powering the electric motors, and supercaps storing energy recovered during braking, which in turn relieves the diesel engine during acceleration. The prototype has been demonstarted in various cities, including Zug, Luzern, Sankt Gallen and Tübingen. A correspondent informs me, that the news of the demise of Mirage + B4 sets on route 4 was premature. At least 1679+789 and 1680+790 have seen service in January. It is reporetd on bahnhofplatz.net that Mirage 1689 is now running on route 8 in all white livery, presumably ready for the next football livery. The latest football livery has been applied to 2051+2425. The tram advertises Swiss (the airline) and has several airline seats fitted. It is not clear, however, whether passengers will be required to use seatbelts. The last goods traffic on WSB's Oberentfelden to Shöftland line will cease at the end of this year, with the last customer, a Shöftland flour mill, switching to road haulage following a change in ownership. The exchange sidings at Oberentfelden will be dismantled. The only remaining goods traffic on WSB will be the Suhr to Reinach/Menziken service. Be4/4 12, Te2/2 47, X206 and X211 have been scrapped. All of these vehicles have been out of use for some time now. The Te2/2 is one of the shunting locomotives rebuilt from ex Zürich "Bertschinger"-type trams (of which Ce2/2 176, 1208 and AGB Ce2/2 2 are surviving examples in Zürich and Xe2/2 1905 is a rebuild). 49 is now the only vehicle of this type to remain on WSB. The Be4/4 may well be followed by other older Be4/4's in the coming months. WSB is a narrow gauge railway from Aarau to Menziken and Schöftland. It mainly carries commuter traffic. This morning at about 5:50 a tram collided with a lorry at Radiostudio. The tram driver was severly wounded and had to be cut out of his cab, an operation taking one and a half hours. 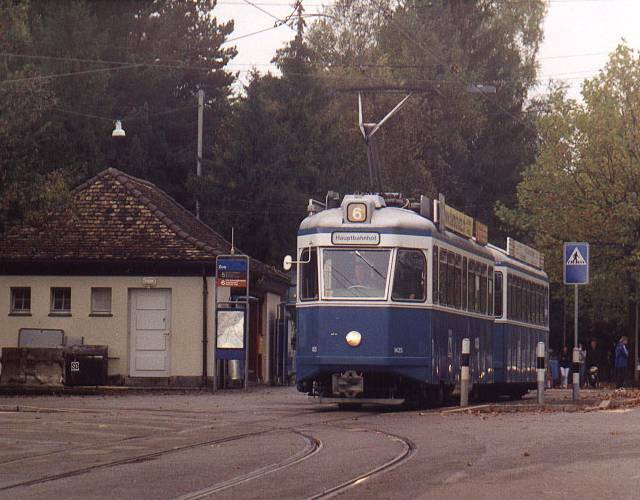 The tram (number 2060) was leaving Oerlikon depot for service on route 15. The exact cause of the accident is not clear. No passengers were on board. The tram is claimed to be a write-off. A Merry Christmas and a happy new to all readers! 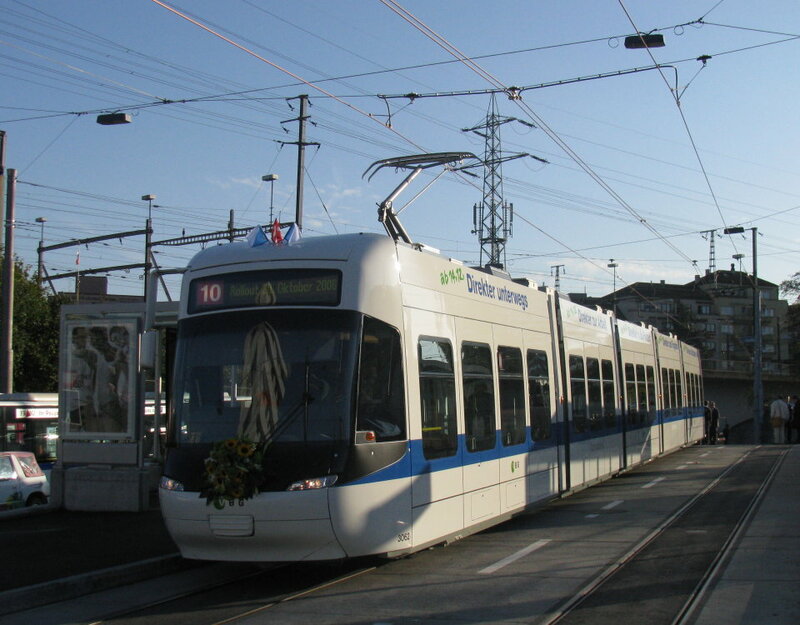 All 2007 news items (132 in total) have been moved to: www.proaktiva.ch/tram/zurich/newslog/2007.html#latest. 2007 was an eventful year. 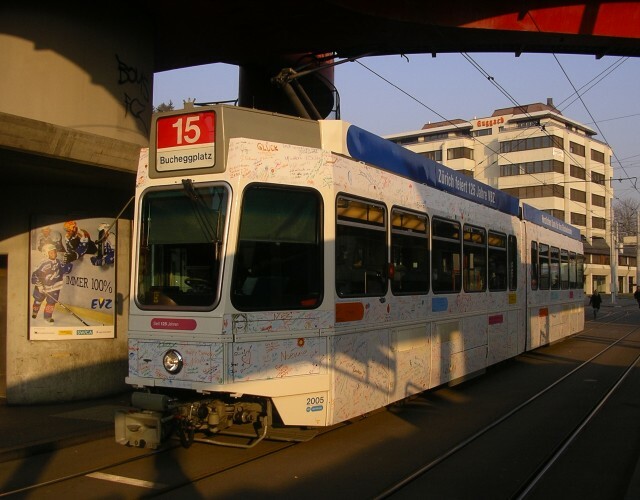 For VBZ, it marked the 125th anniversary of trams in Zürich (although the tram aspect was played down slightly, with it being officially said that it was the 125th anniversary of public transport). The height of the celebrations were no doubt the opening of the tram museum at Burgwies on May 26th. This marked the conclusion of a long and challenging campaign to obtain political approval for the project and raise the necessary money. The previous museum at Wartau had already been closed in October 2006, but will be retained as a museum workshop and parts store. The new museum is considerably larger and permits most of the collection to be displayed in a single location for the first time, while still allowing sufficient space to walk around and admire the vehicles. The museum also includes a mezzanine viewing gallery, a model tramway and a well equipped shop. Tram Museum sources suggest the museum is a success. 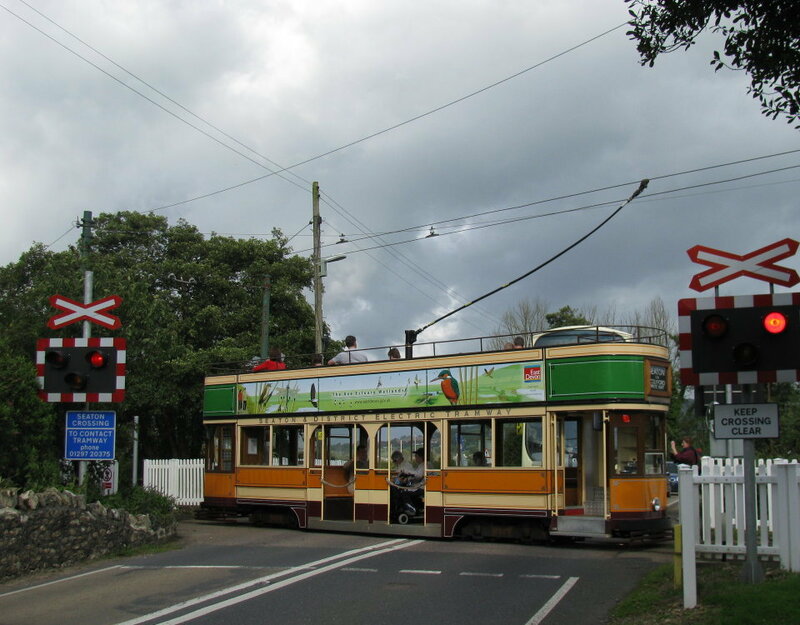 Further to the anniversary, tramcar number 2005 was repainted as a birthday card that members of the public were able to sign. 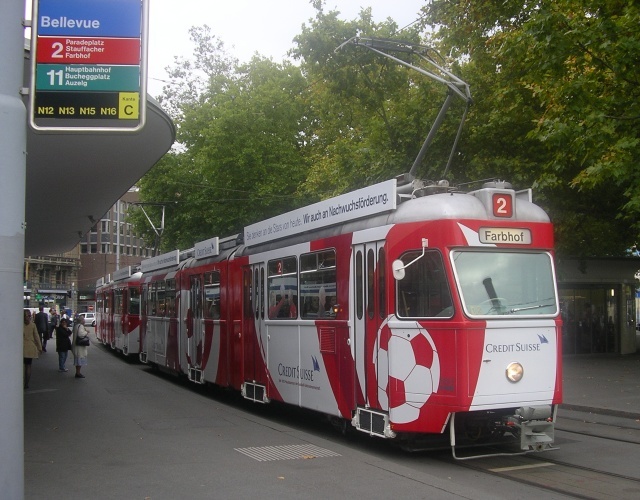 After a period of a very restrictive policy towards special liveries, three trams and a trolleybus have been repainted in sponsored liveries for the approaching Euro 2008 football championship (that is soccer, for American readers). This is being jointly hosted by Austria and Switzerland, and three matches will be played in Zürich's Letzigrund stadium. The first of these sets, Mirage set 1683+1717 is sponsored by Credit Suisse, with the company's own name taking a civilised second place behind the event being advertised. The following adverts, for Carlsberg (2087+2428), Volkswagen (trolleybus 63) and Coca Cola reverse this concept however. Let us hope that this is not the first step towards overthrowing Zürich's policy of resisting the temptation of permitting all over advertising liveries to transform trams to rolling billboards. 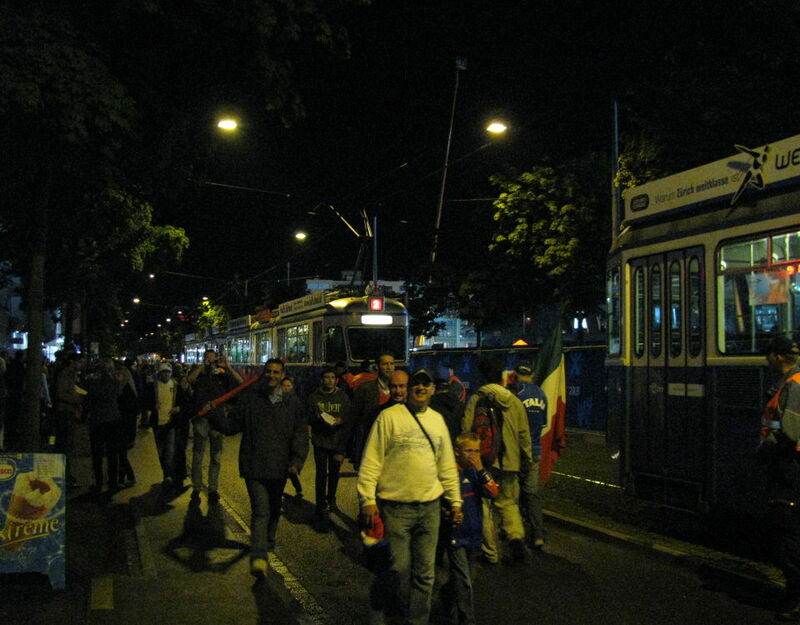 The football event is also connected to the tram in another way. 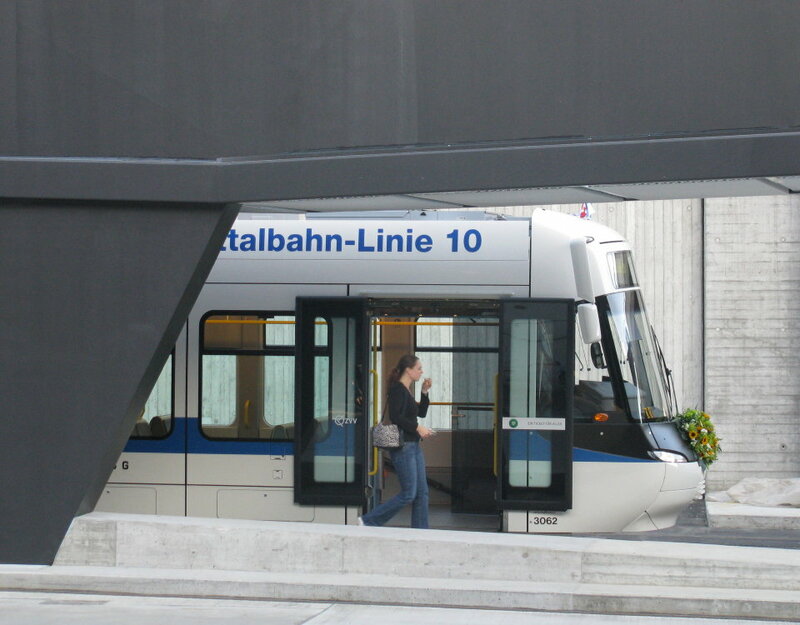 The Tram Zürich West project was originally envisioned as being completed in time for the 2008 event. 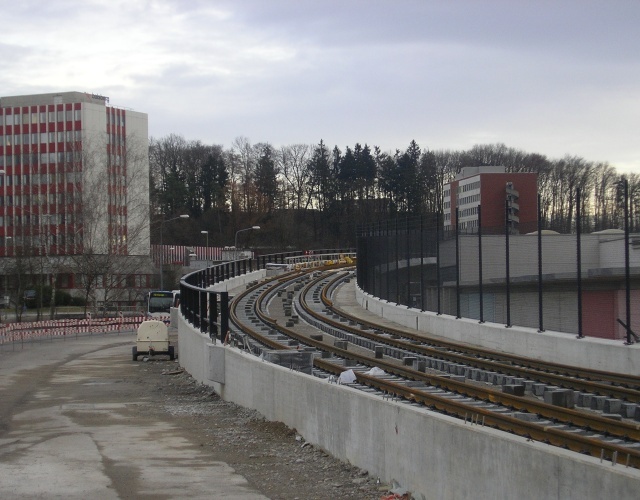 Opposition to the rebuilding of Hardturm stadium led to the project being transferred to Letzigrund, and so killed all hope of the new tram line being able to meet this ambitious target. Further delays mean that, ironically, work cannot now start until after the event (for security reasons). However, the last major hurdles wer cleared when two referenda were accepted by overwhelming majorities. These were the city referendum over 59 million Franks on 17th June and the cantonal referendum over 90 million on 25th November. If work does begin by 2008, federal contributions will halve these costs. An opening date of 2011 is now envisaged. On the other side of town, meanwhile, construction of the second phase of Stadtbahn Glattal (serving the airport) is making good progress and set for a December 2008 opening. 2007 also saw an unexpected line extension. 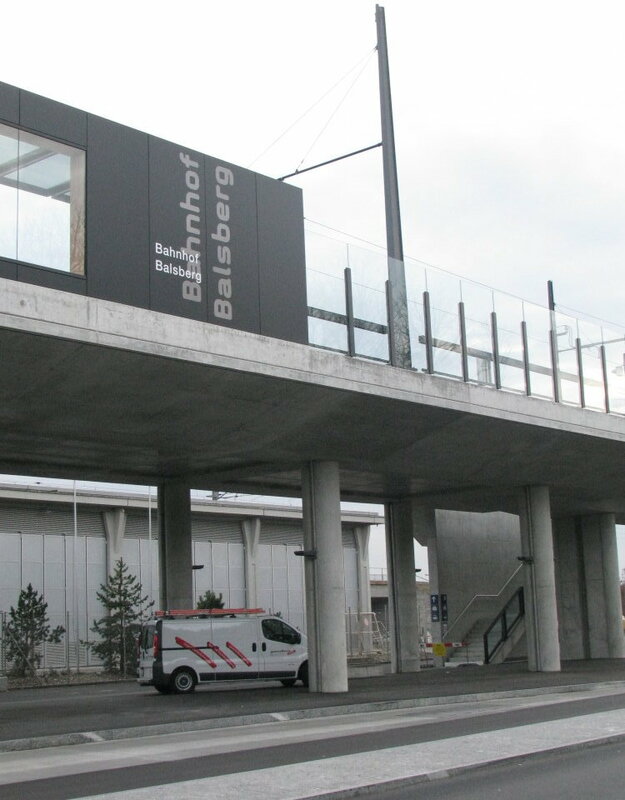 Private contributions meant that the extension of route 5 from Bahnhof Enge to Laubegg, serving the Sihlcity shoping centre, could open on 22nd March rather than December 2008 as previously planned. 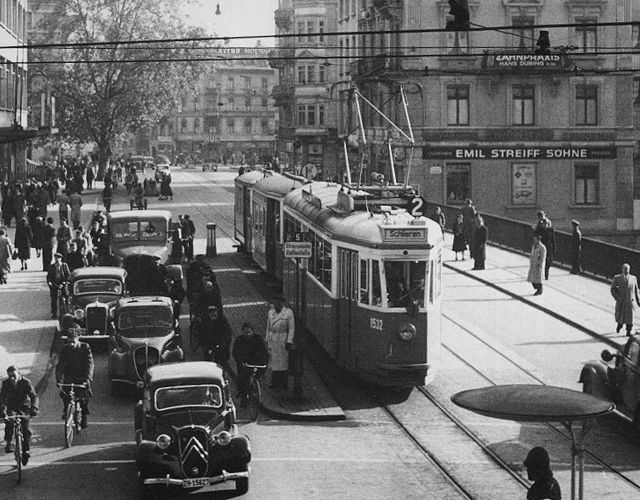 A traditional feature of Zürich's trams, the roof-mounted route boards, are set to be replaced by electronic displays, ending a tradition going back 125 years — to the very first tram that ran in the city. With the rapid deliveries of Cobra trams, more and more Mirage units are being rendered surplus. Even so, they are still a common sight. 2007 saw their demise on route 4, but they can still be seen solo on the 8 and in pairs on the 2, 7 and 13. 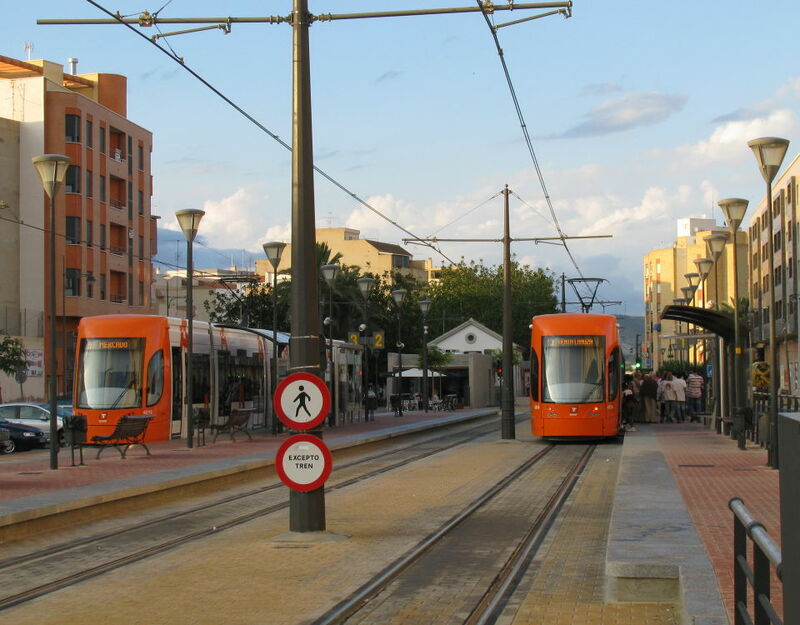 The 8 and 7, however, are increasingly seeing Tram 2000 units displaced from other routes. Cobras operate all of route 4 and share with Tram 2000s (20xx + 24xx) on route 9 and with Tram 2000s (20xx + 20xx/23xx) on the 11 and 14. Tram 2000s (20xx + 24xx) furthermore work the 3 and 5 with Tram 2000 Sänftes on the 6 and 10 and helping out on the 5 at weekends. It is likely that several surplus Mirages will be sent to the Ukrianian town of Vinnitsa soon. Meanwhile, several of the type without cab (Blinde Kuh 1691-1726) have been scrapped, a policy that is likely to continue in view of the limited deployment possibilities of such trams. 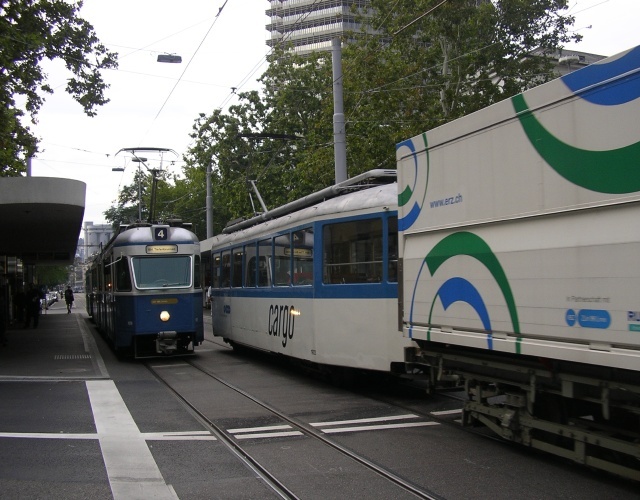 2007 also marked the demise of the B4 trailers, so ending the era of the Swiss Standard Tram as far as Zürich is concerned. The first Standard Tram entered service in 1939, the B4 trailers that were still running in 2007 dated to the early 1960s however. On the trolleybus side too, the ongoing delivery of new Hess vehicles is rendering older Mercedes/ABB vehicles surplus. Several have been scrapped or redeployed as driver trainers. It is likely that others will see further service in Eastern Europe. Deliveries of the shorter Swisstrolley3 vehicles (144-161) is now complete, with the longer (double-articulated) Lightram3's (61-77) to be completed this year. next year | previous year | current year | other years | search.